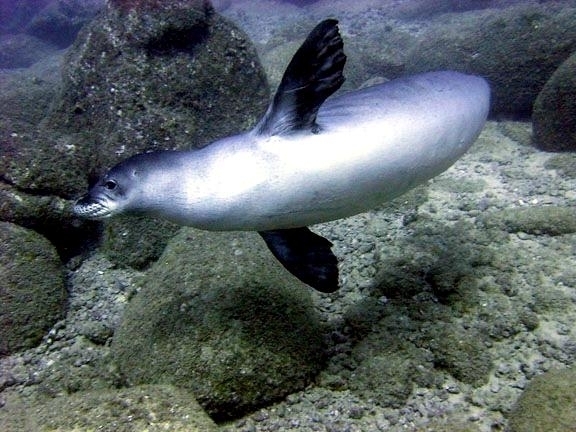 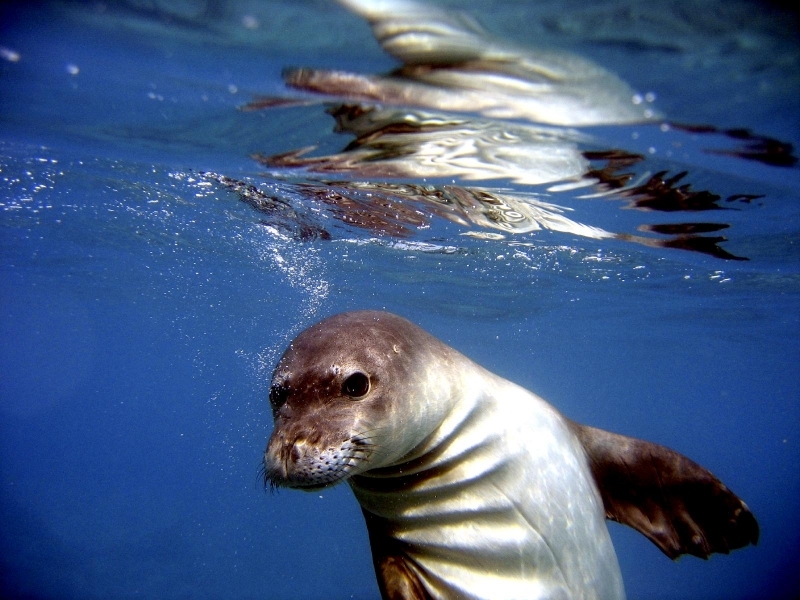 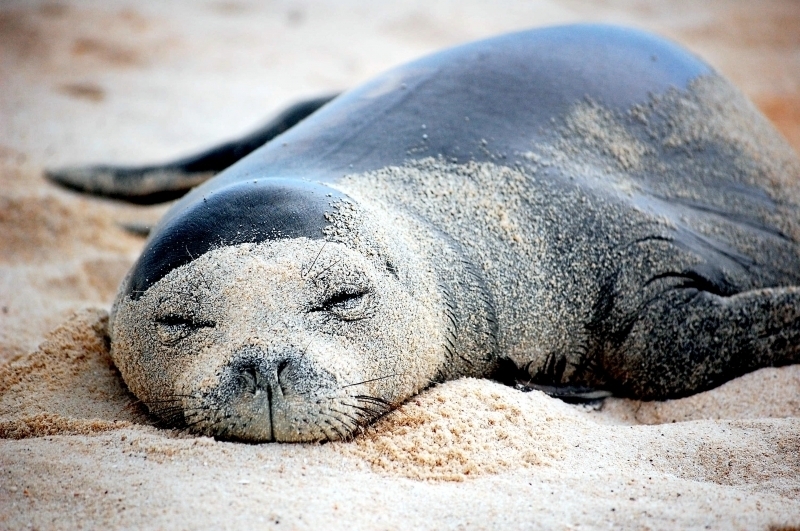 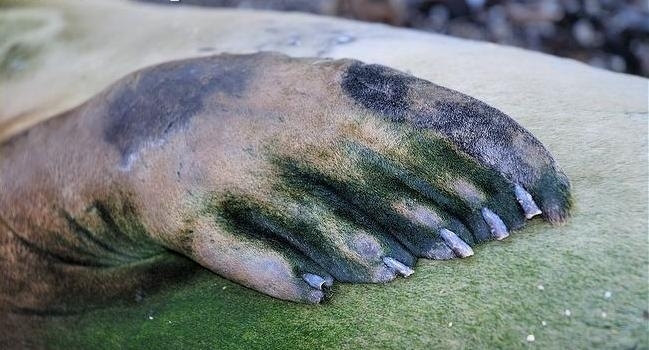 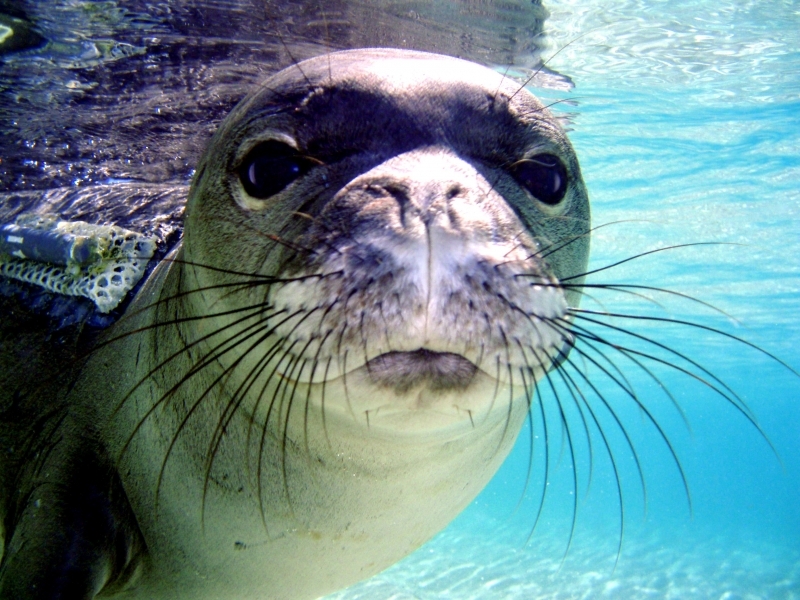 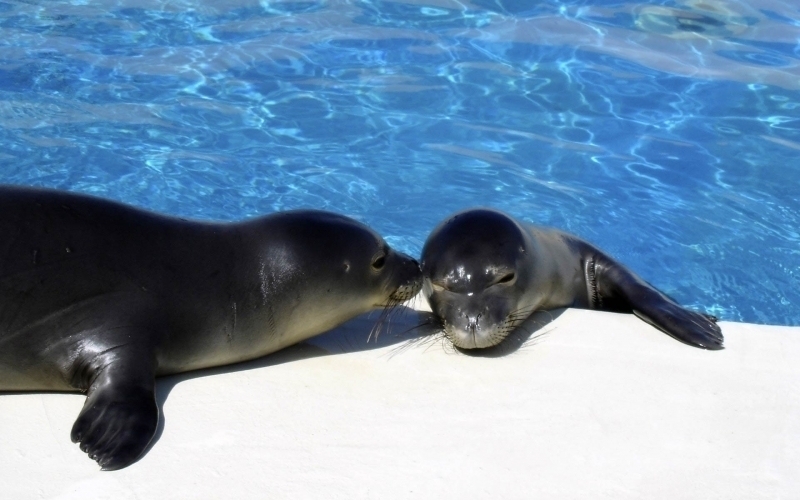 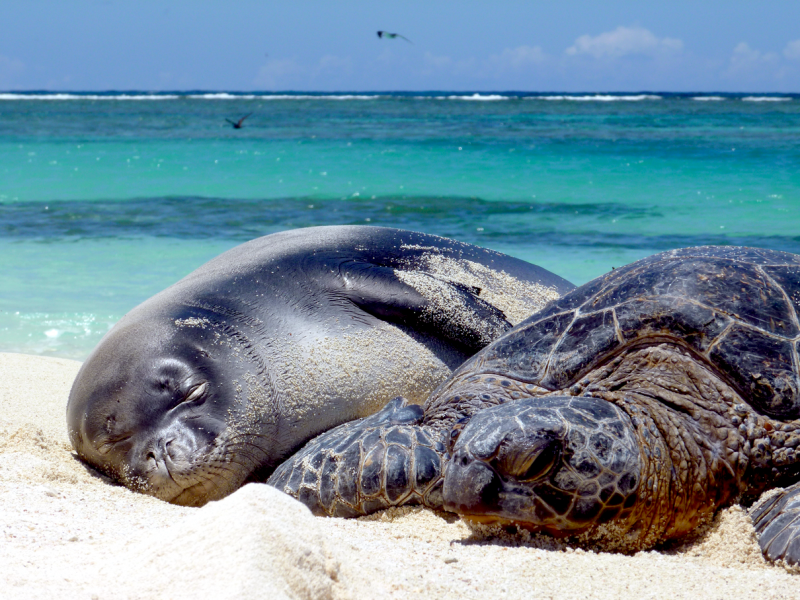 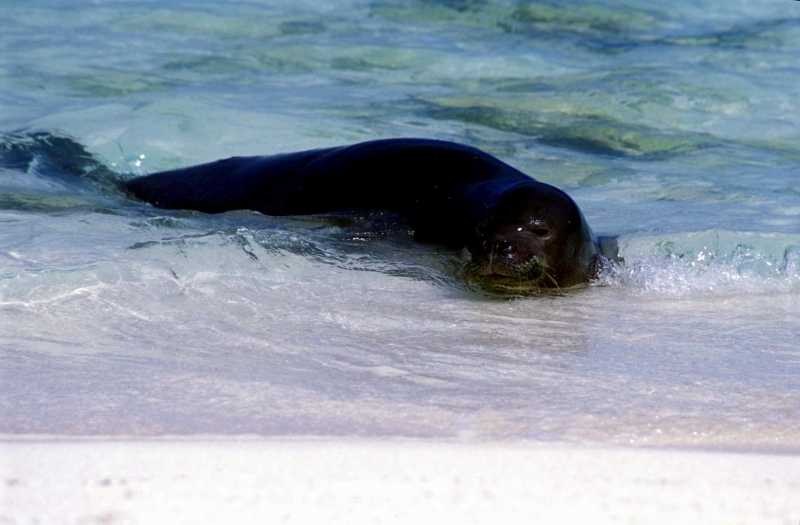 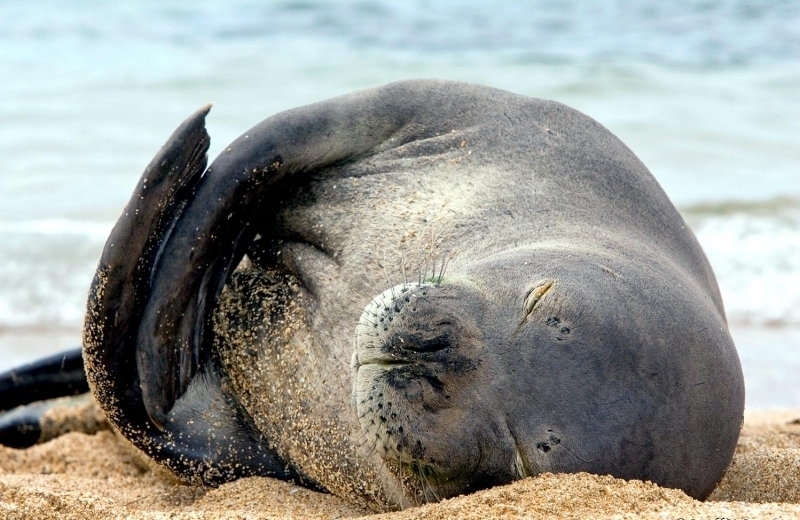 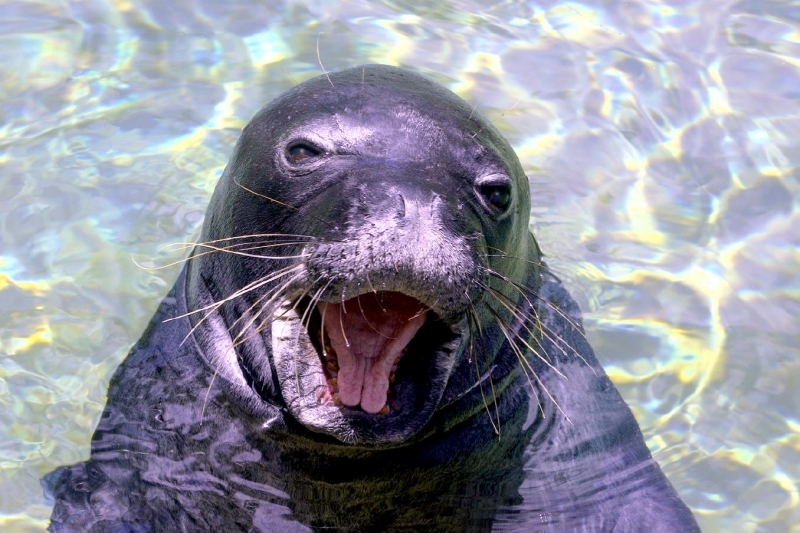 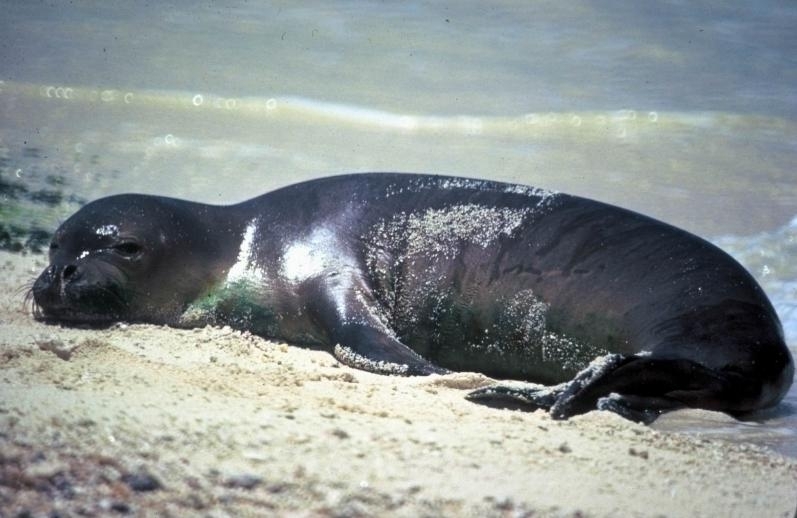 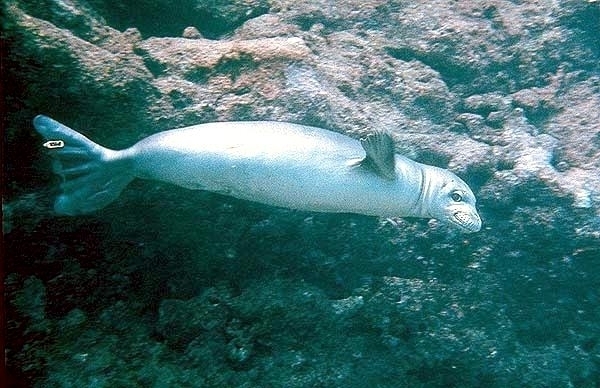 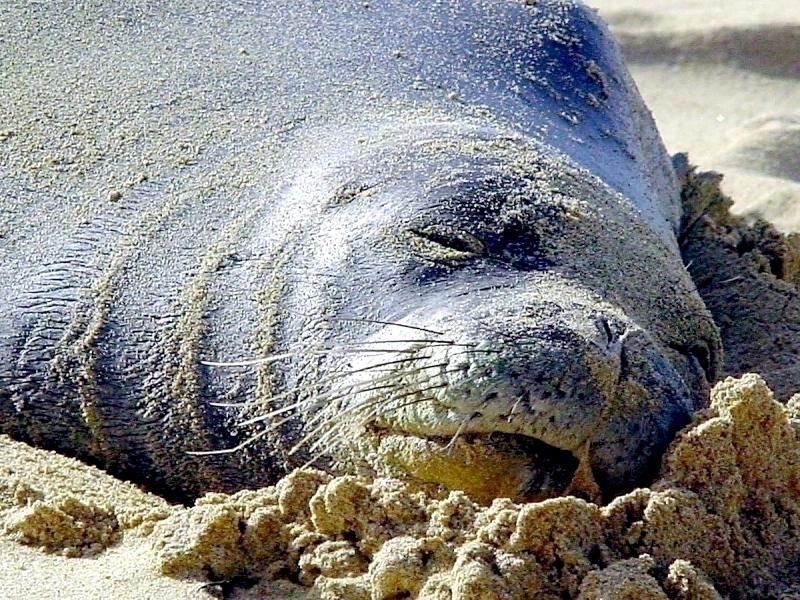 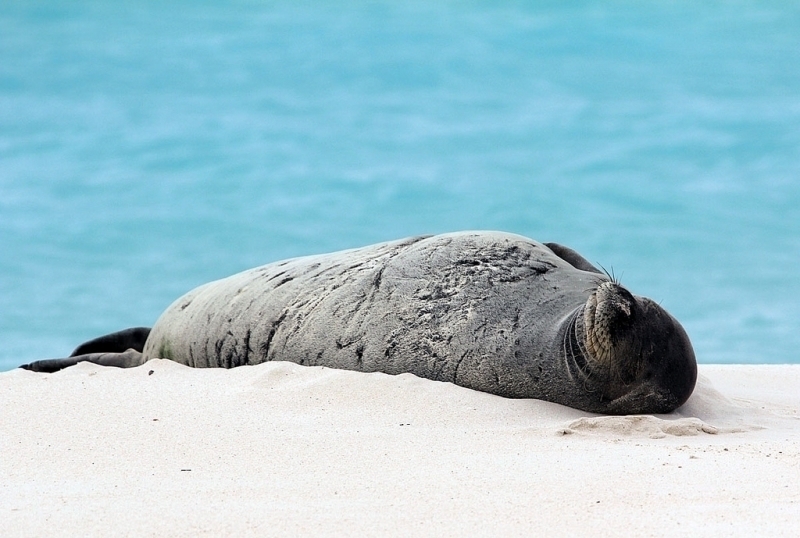 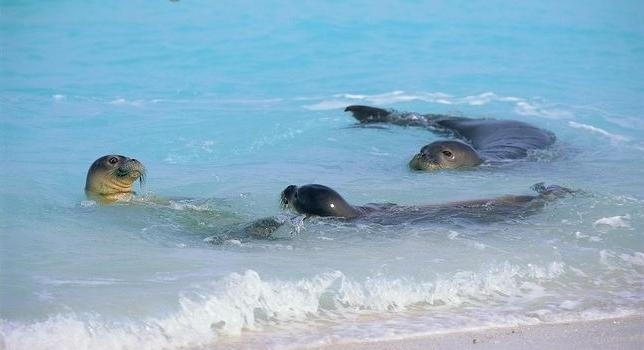 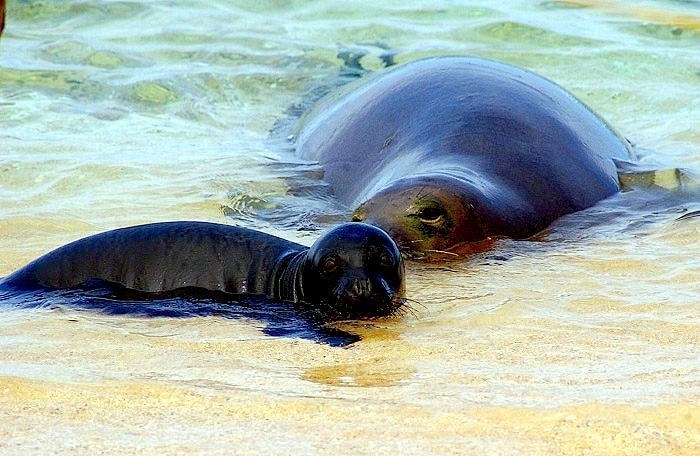 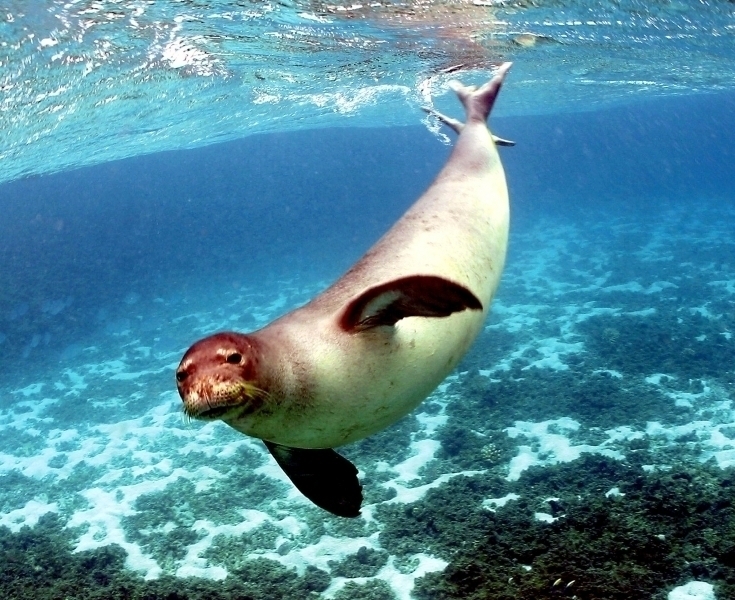 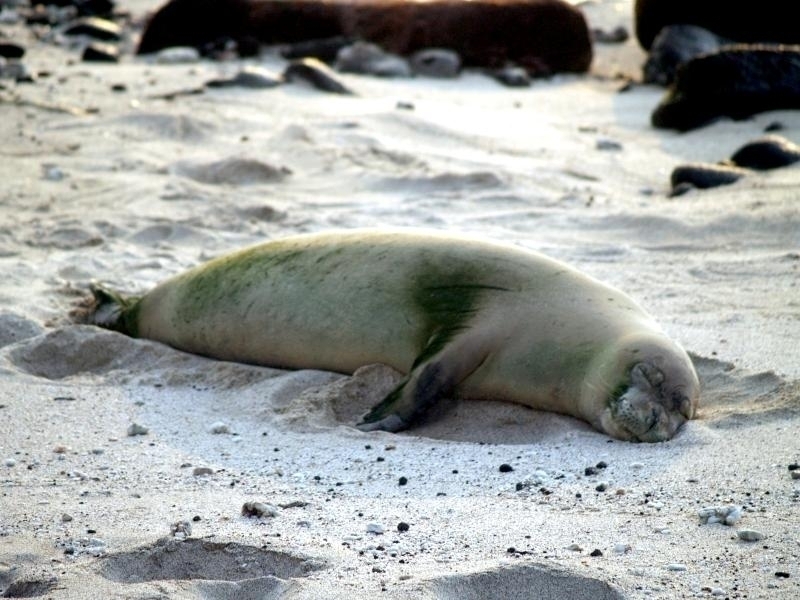 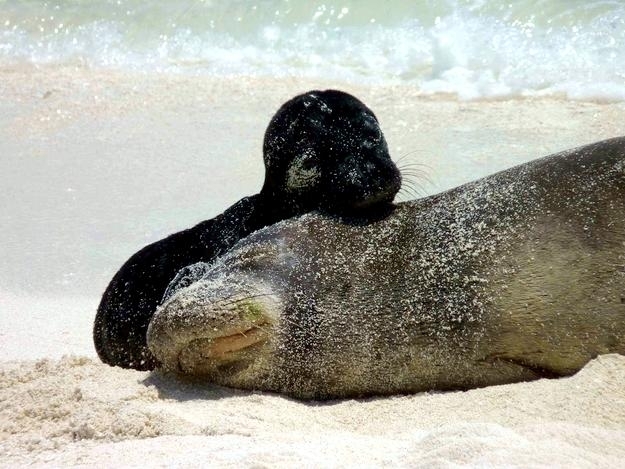 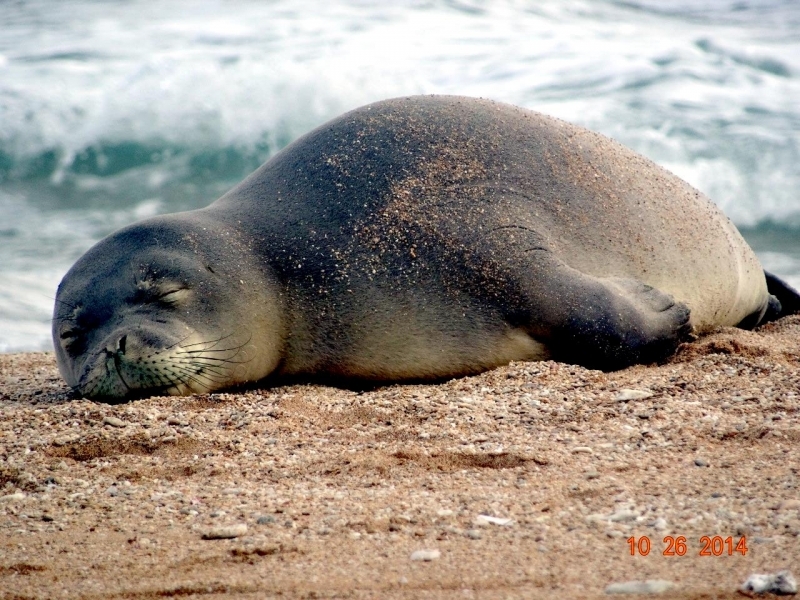 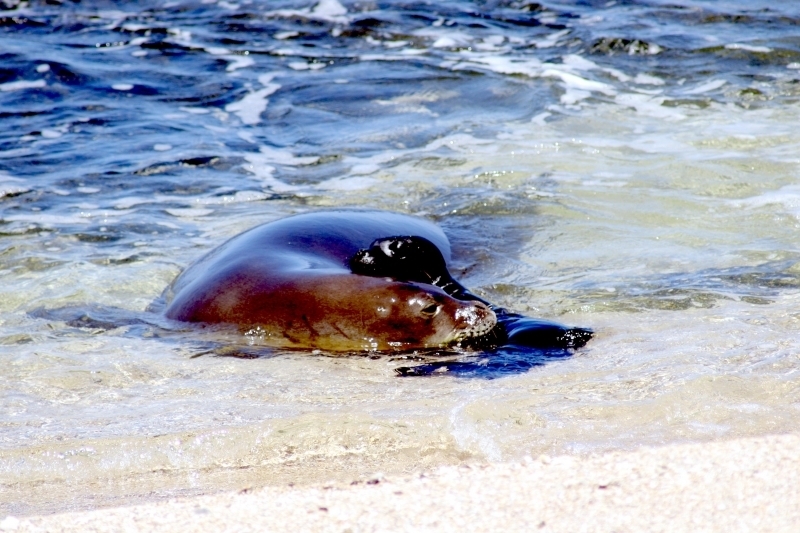 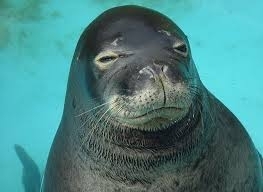 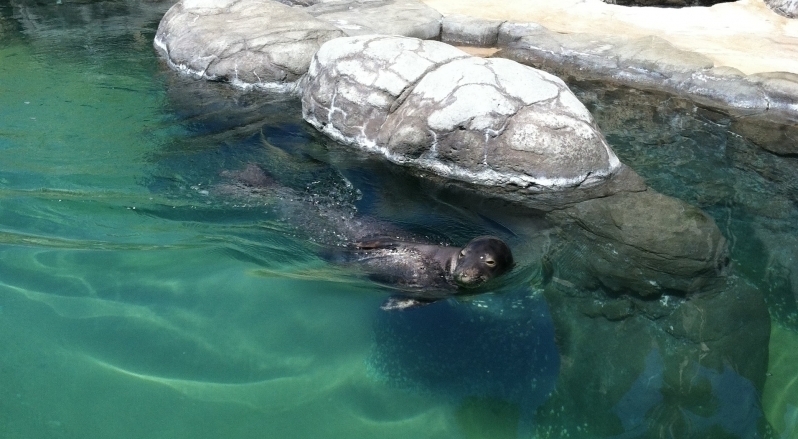 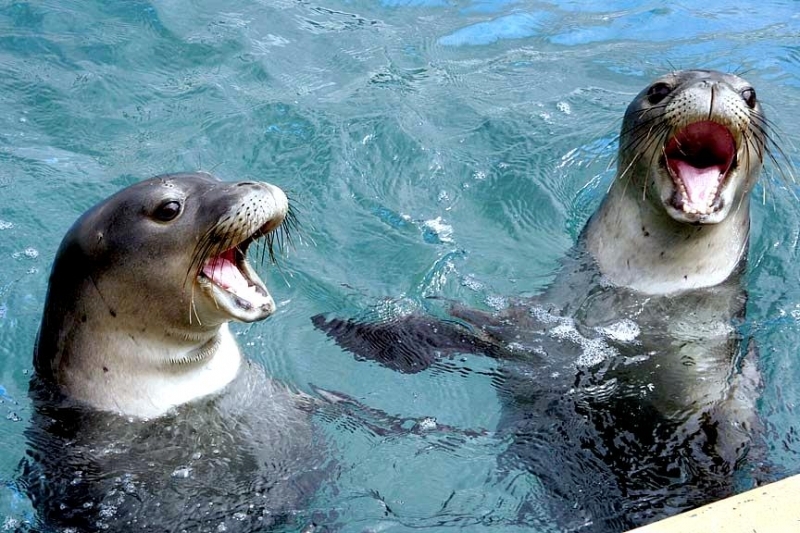 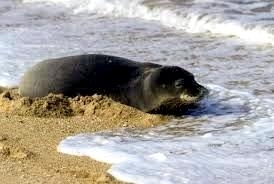 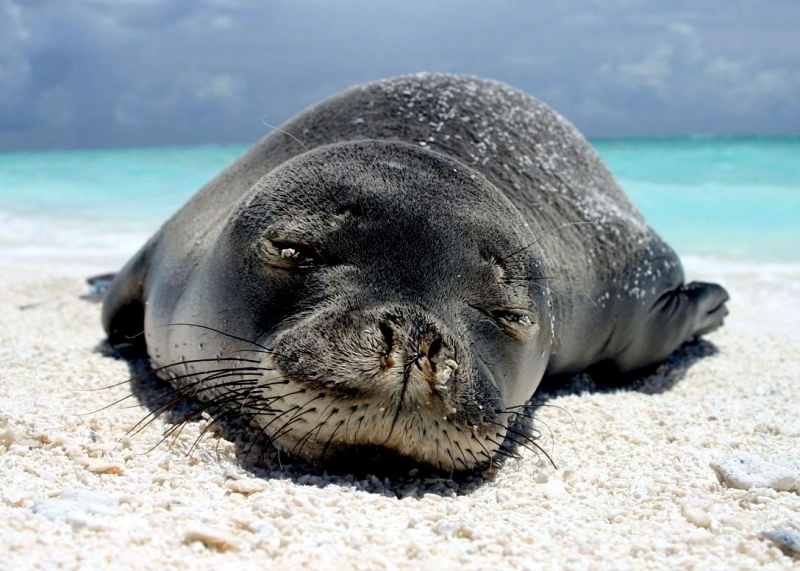 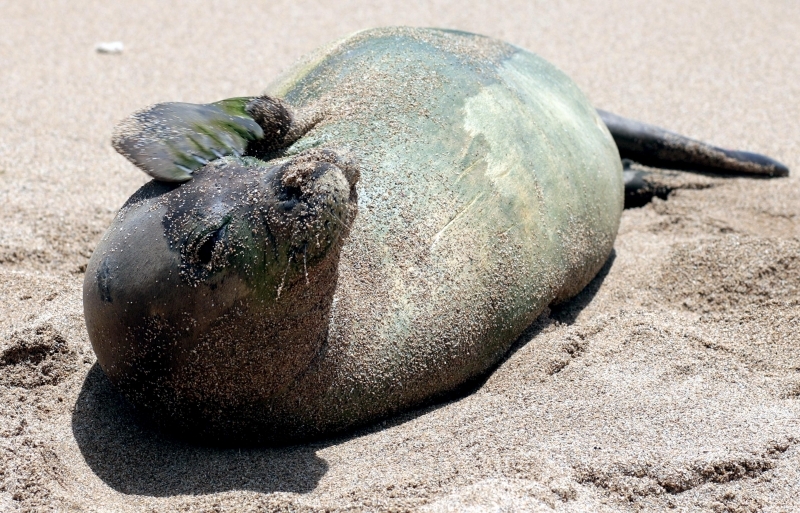 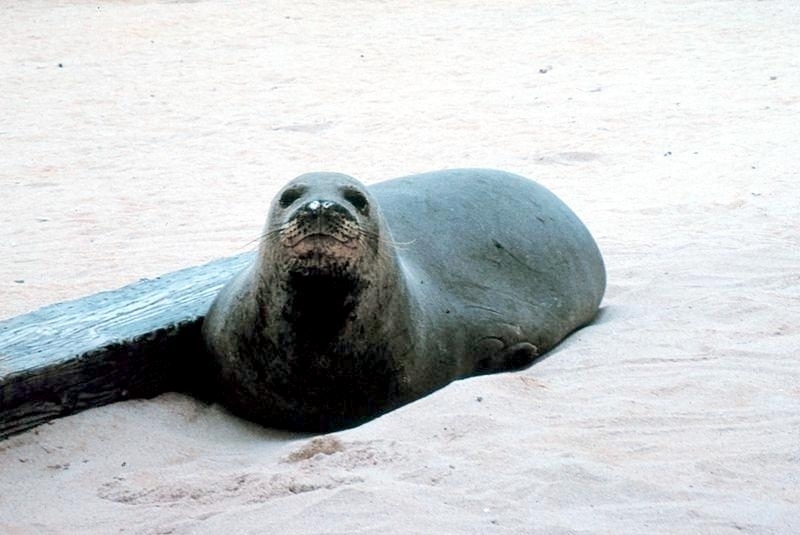 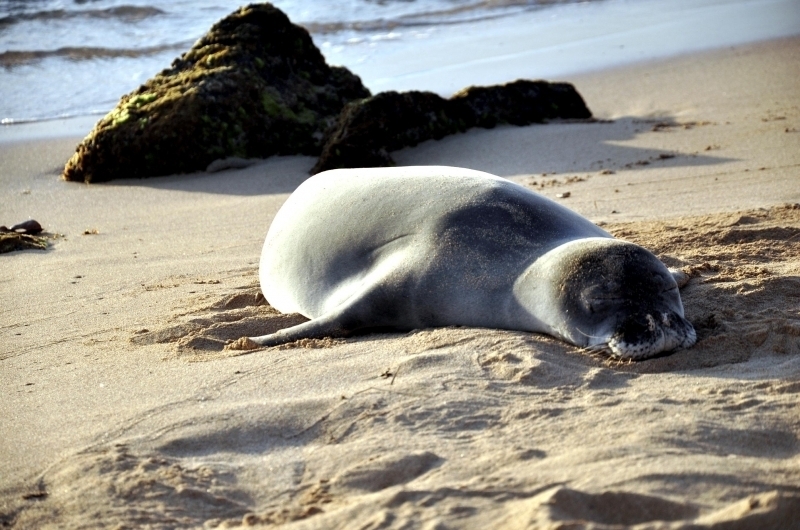 In Hawaii, Hawaiian Monk Seals are called “Ilio holo I ka uaua” which means “the Dog that goes in Rough Water”. 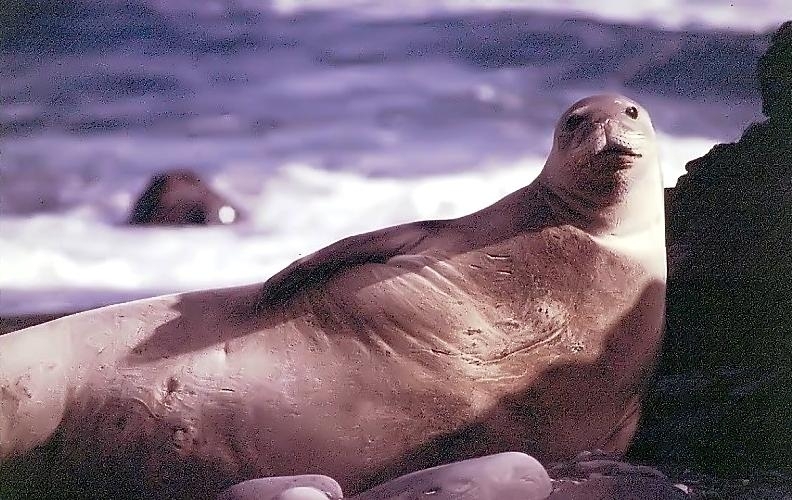 Their common name is from the excess folds of skin around the seal’s neck causing them to look like they’re wearing a monk’s robe and for the fact that this is a solitary species usually found alone or in very small groups. 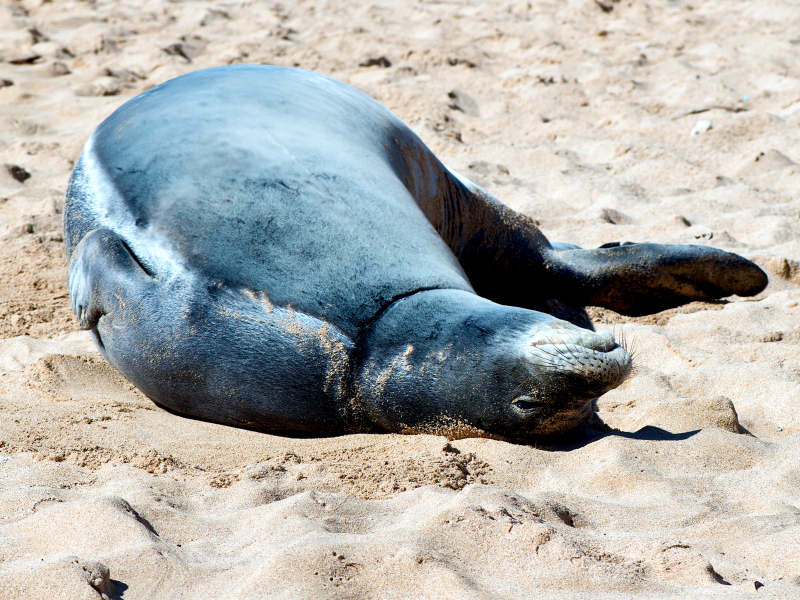 Adults reach an average 2 meters in length of and weigh between 180-270 kilograms. 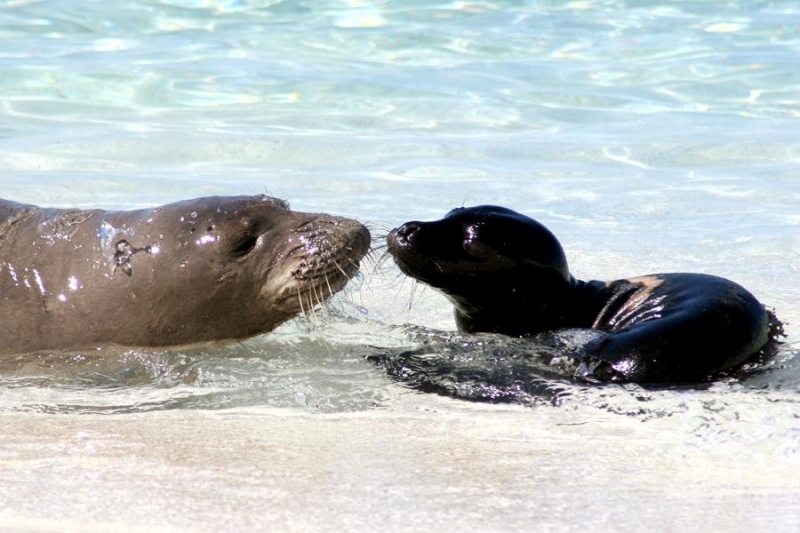 Unlike many other seal species, female Hawaiian Monk Seals are usually slightly larger than the males. 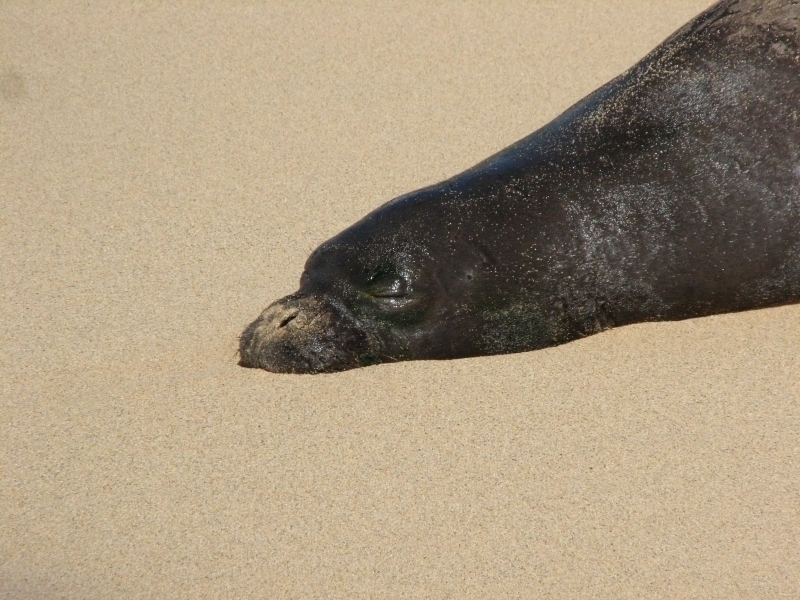 Adult coats are light gray to brown in color with lighter coloring on the chest. 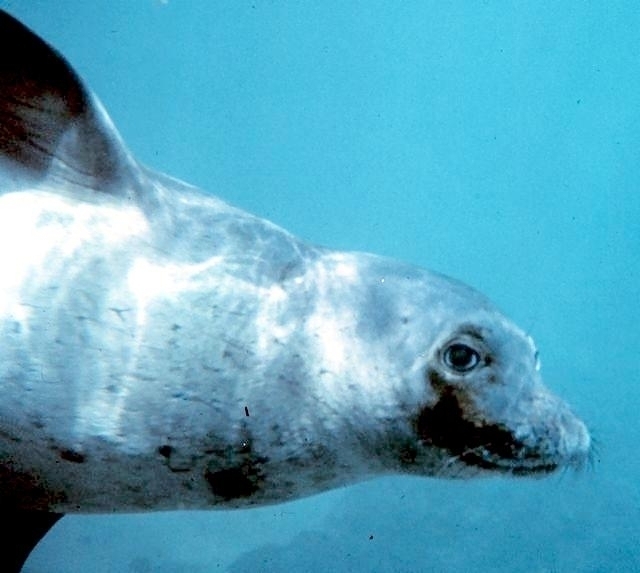 The maximum age for this species is 25 to 30 years, however few seals live that long. 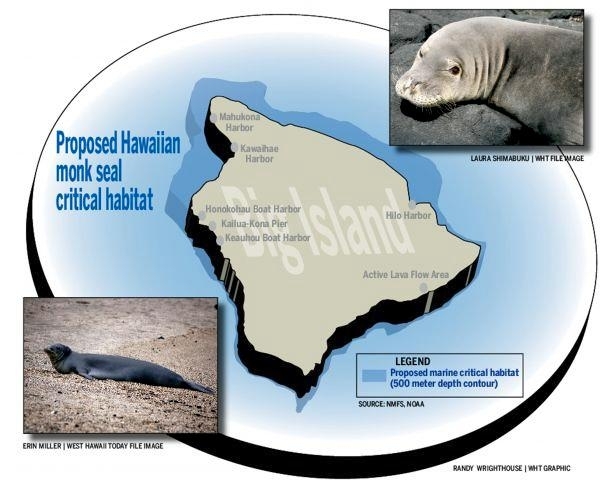 Hawaiian Monk Seals are the second most endangered pinniped species in the world after the very rare Mediterranean Monk Seal. 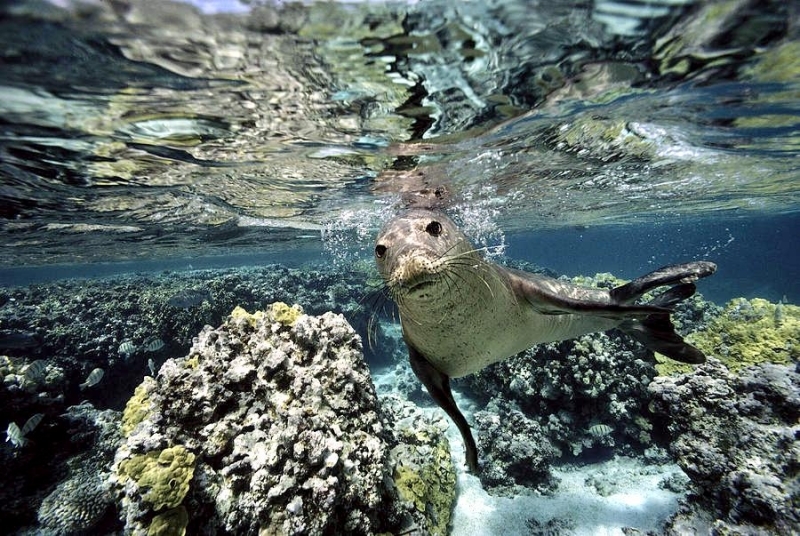 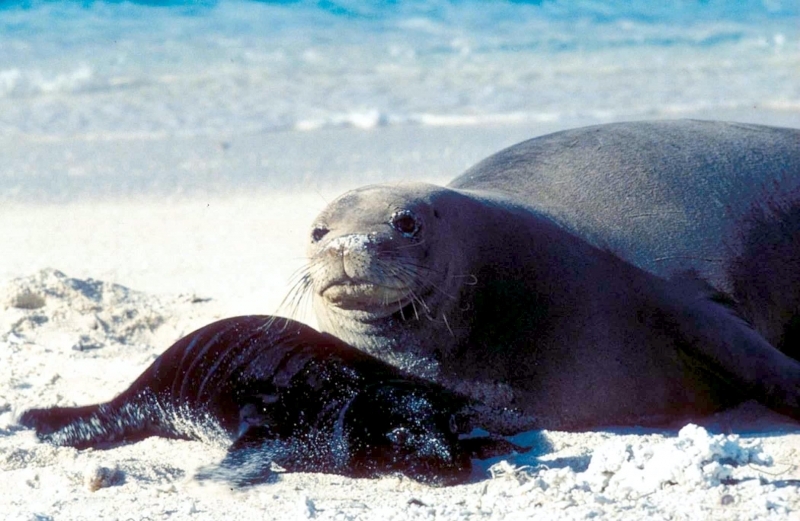 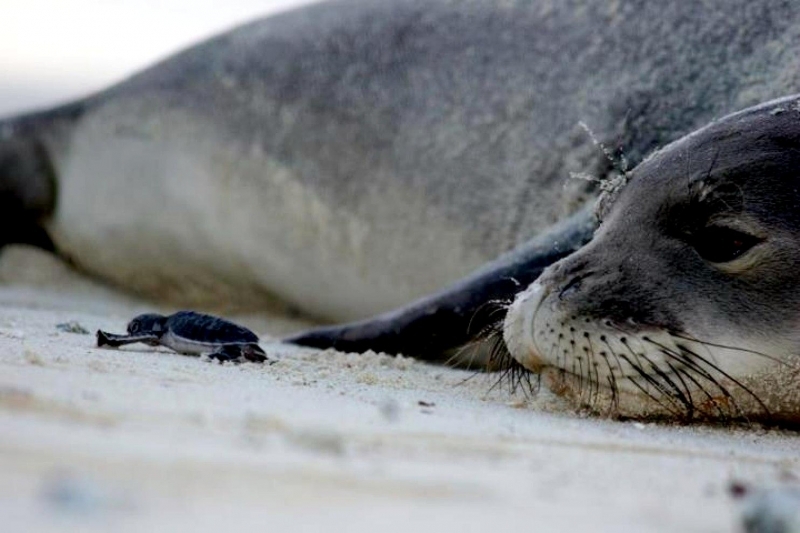 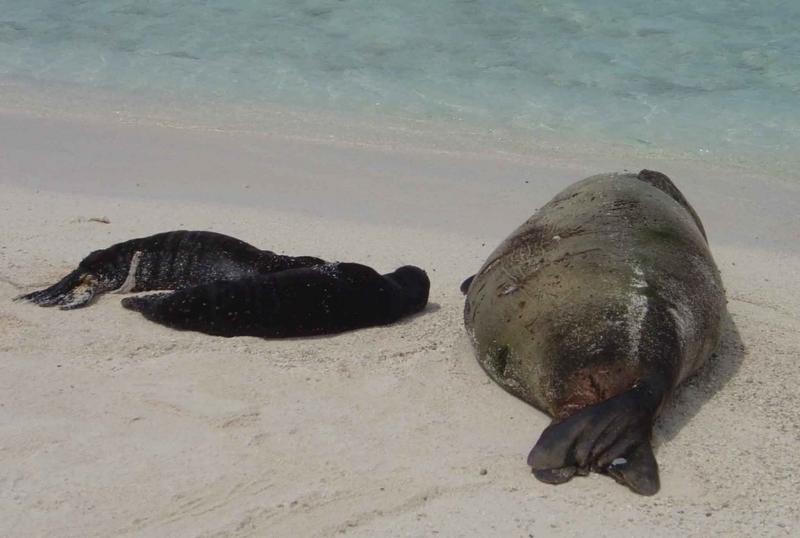 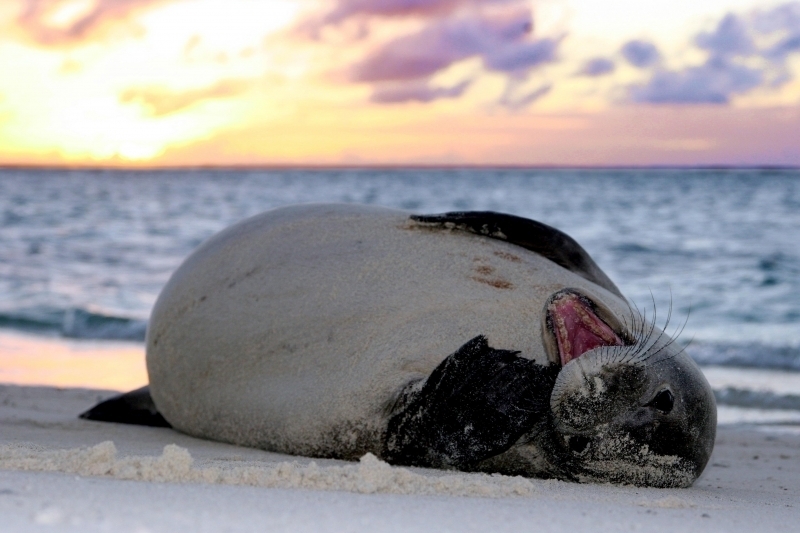 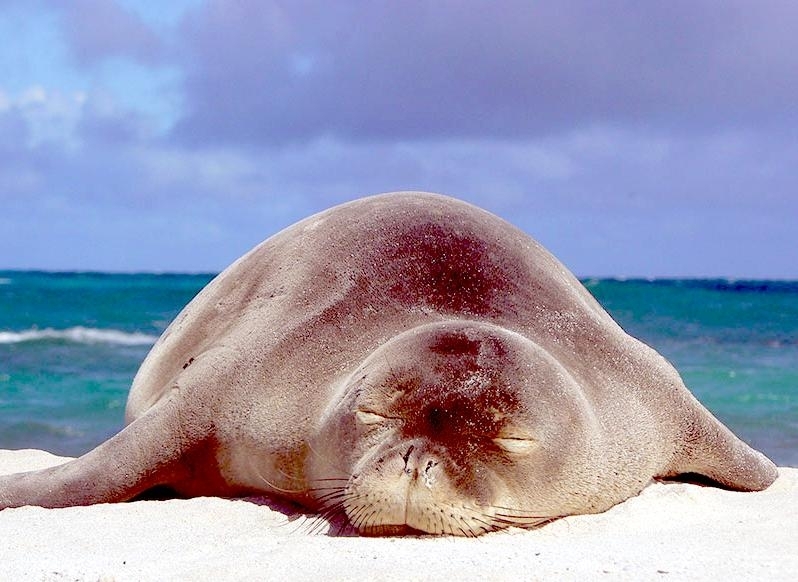 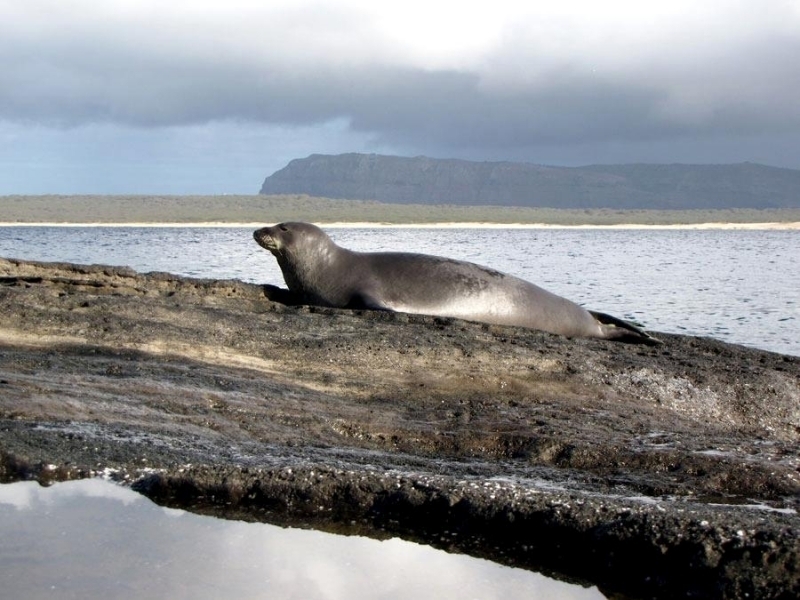 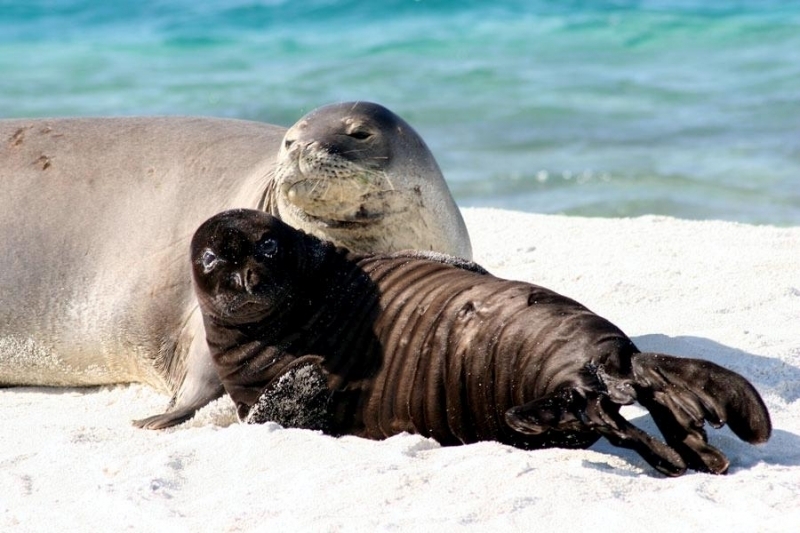 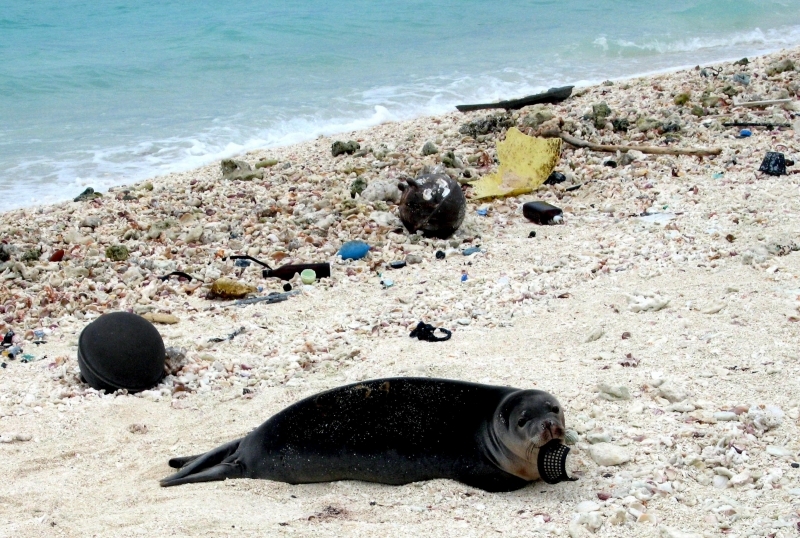 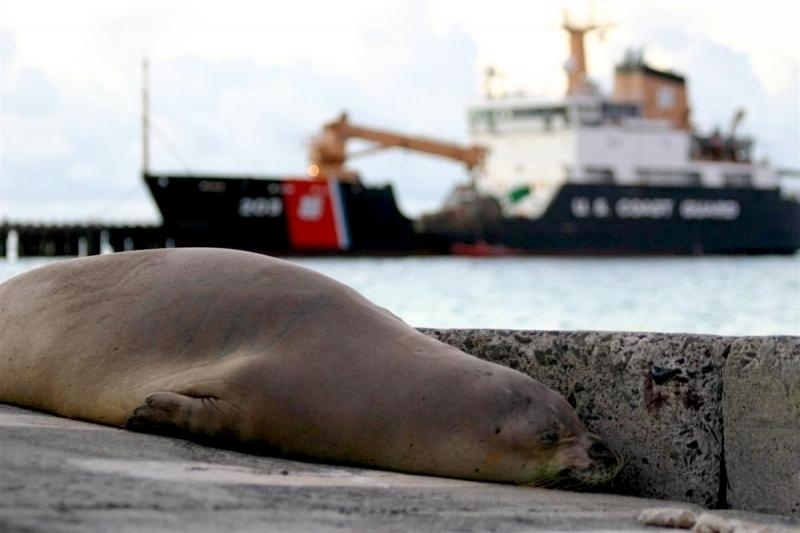 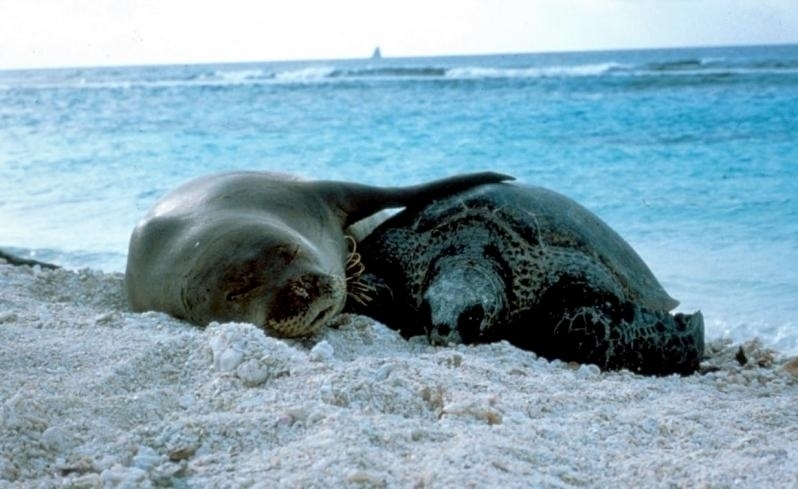 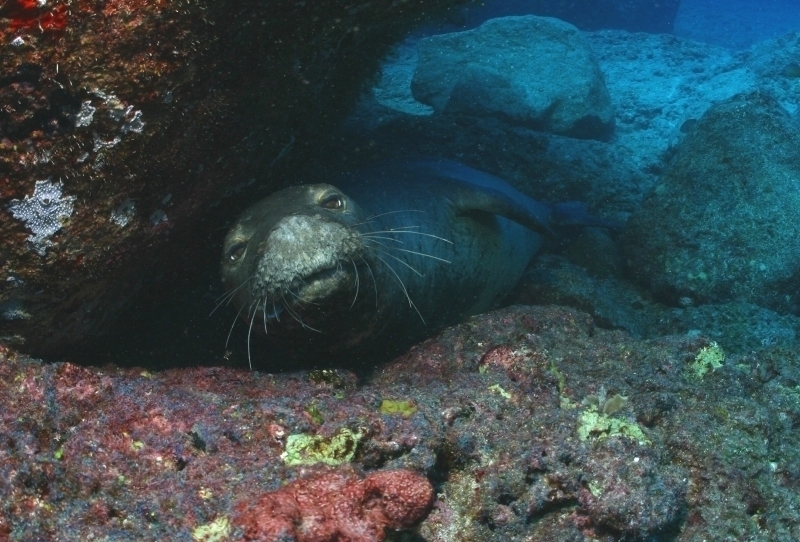 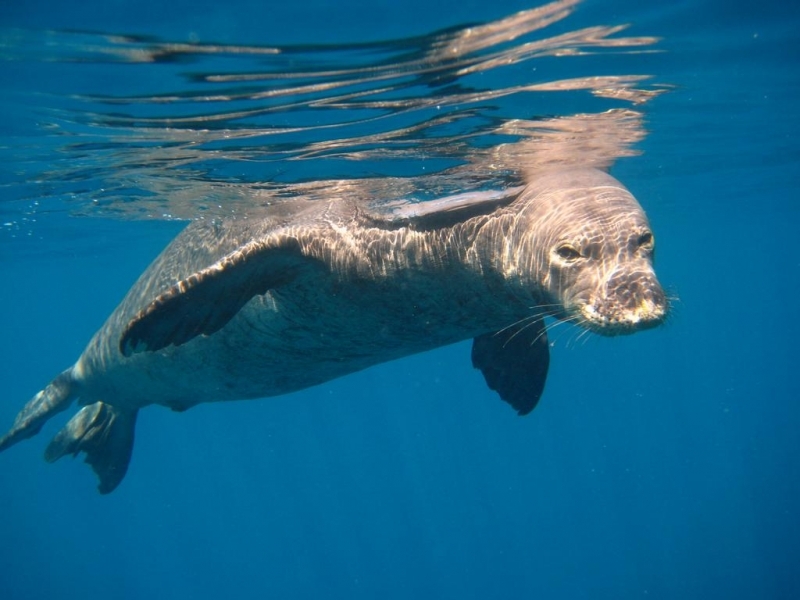 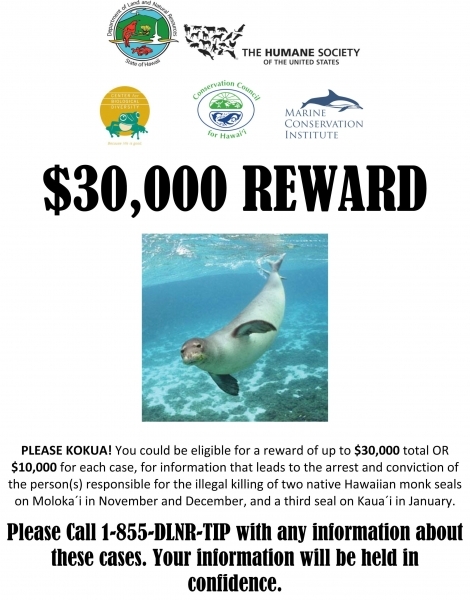 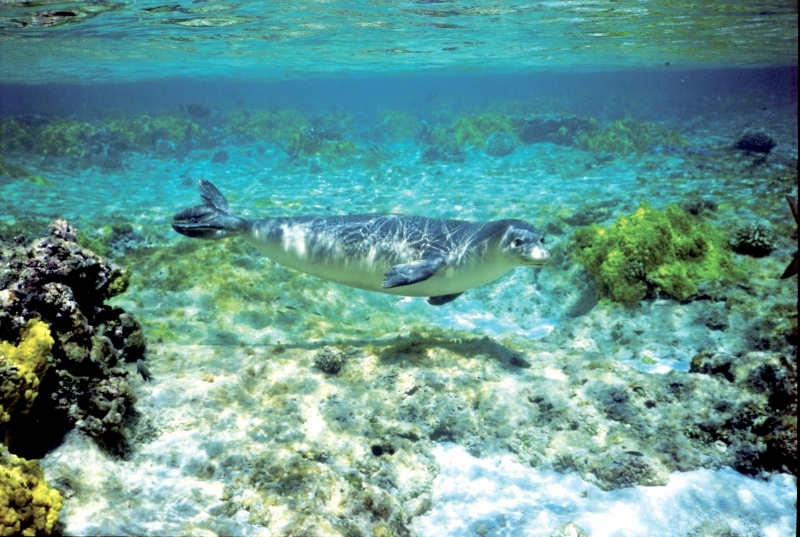 Only 1,300 to 1,400 Hawaiian Monk Seals still inhabit the northwestern Hawaiian Islands. 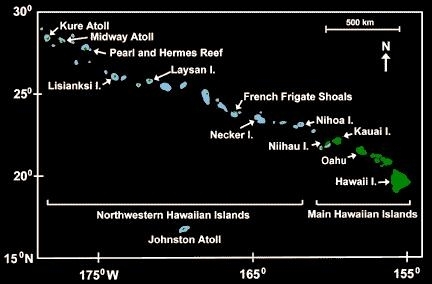 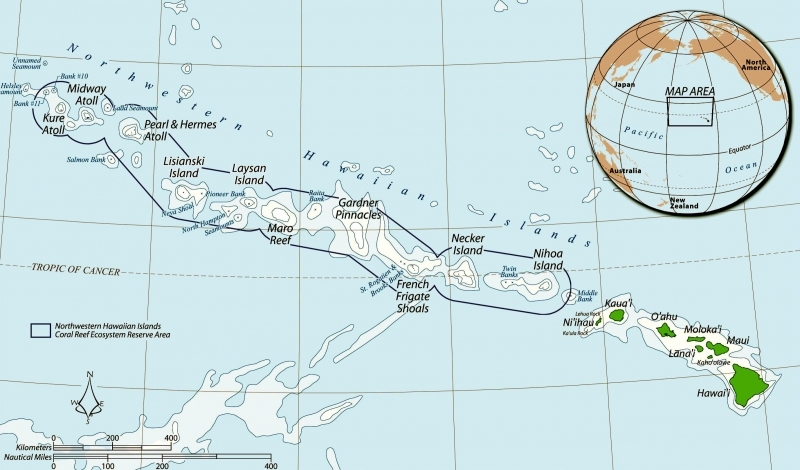 The largest population is found at French Frigate Shoals, others haul-out on Laysan Island, Lisianski Island, Pearl and Hermes Reef, Midway Atoll and Kure Atoll. 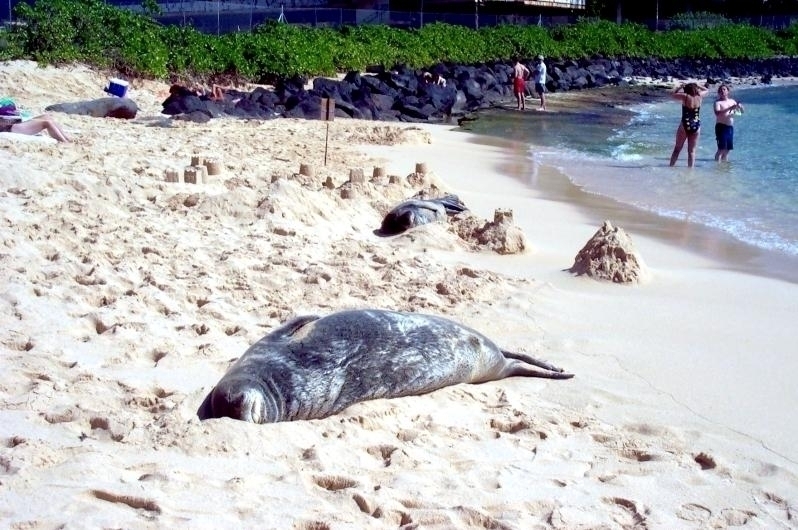 There are additional small colonies at Necker Island and Nihoa Island and a small number of seals can be found on the main Hawaiian Islands. 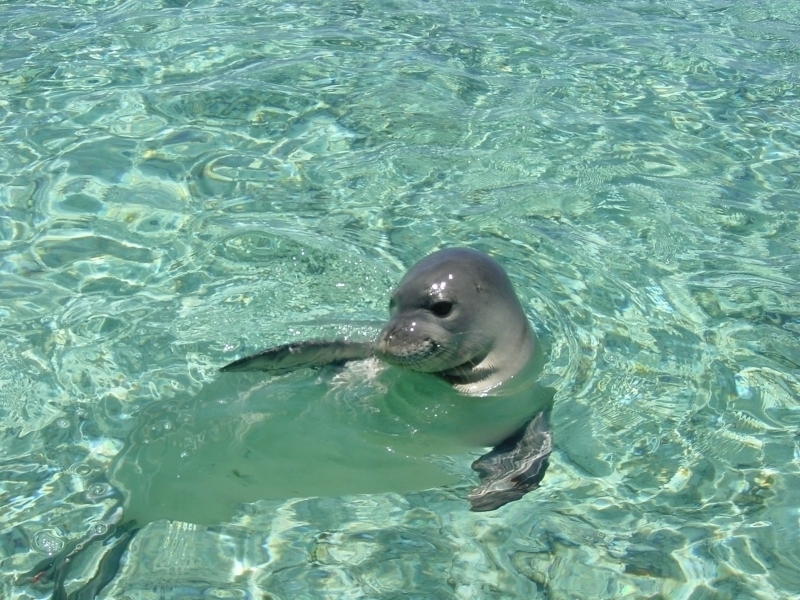 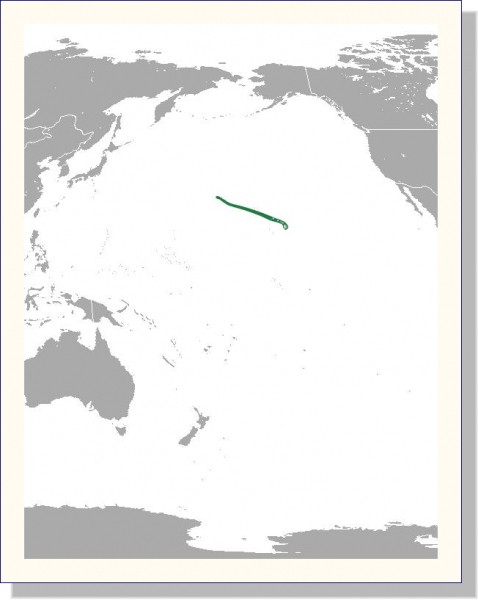 Hawaiian Monk Seals do not migrate and there is limited movement of individuals between colonies. 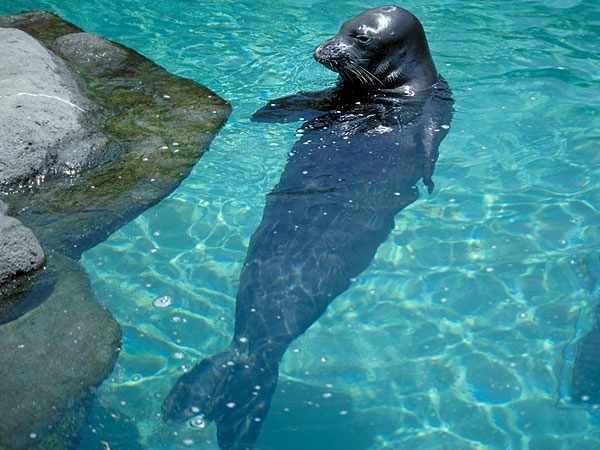 They feed on fish such as eels and flatfish as well as octopus and lobster. 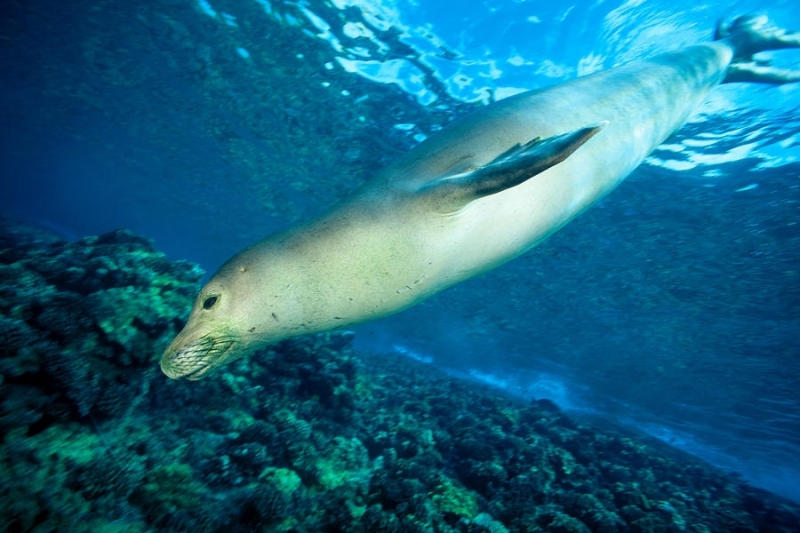 They are often found feeding on the slopes of coral reefs at depths of up to 75-90 meters for an average of 20 minutes. 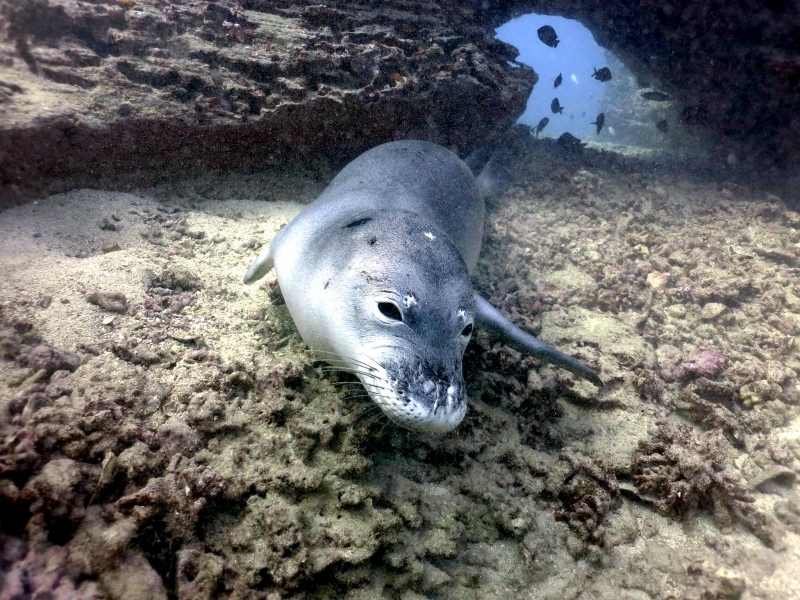 The maximum dive recorded for a Hawaiian Monk Seal is 500 meters. 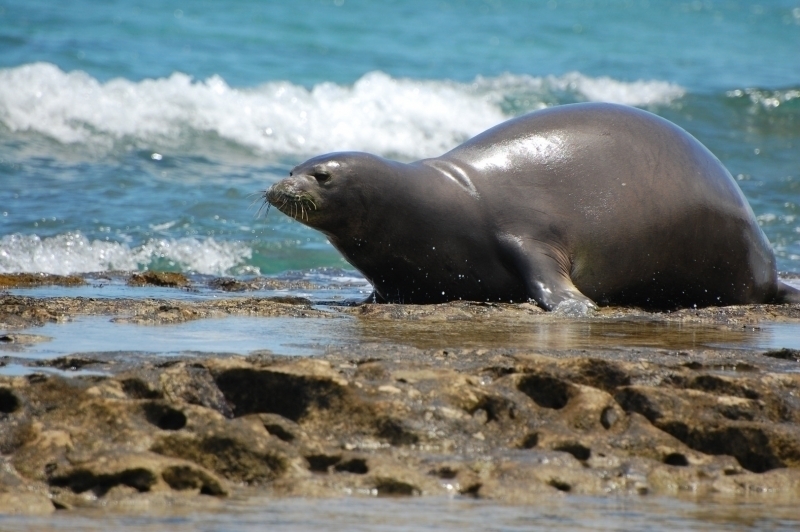 Hawaiian Monk Seals have a slow reproductive rate compared to other seal species. 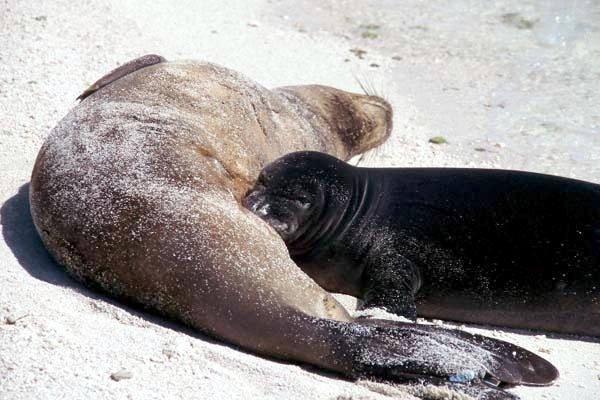 Females do not give birth until between 5-10 years of age. 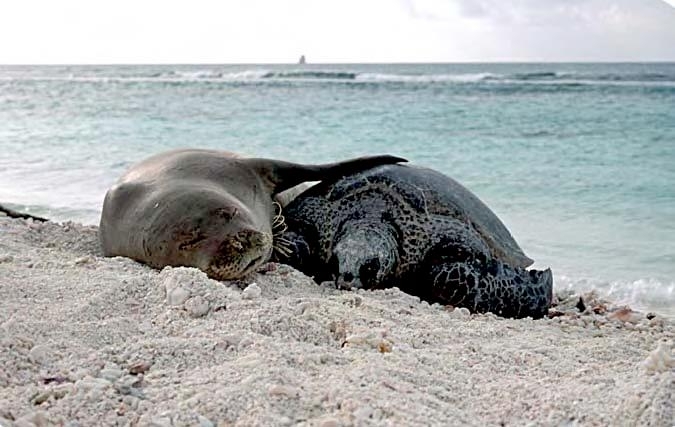 Breeding season lasts from February to July on breeding grounds near protected beaches with very shallow water next to the shoreline. 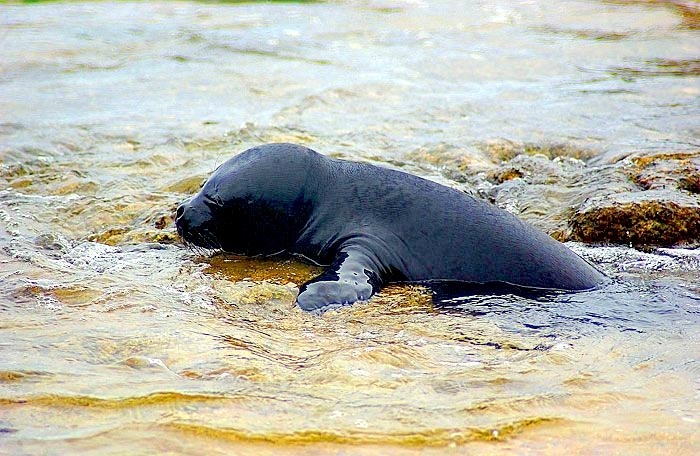 Newborn pups measure about 1 meter in length and weigh about 11-15 kilograms. 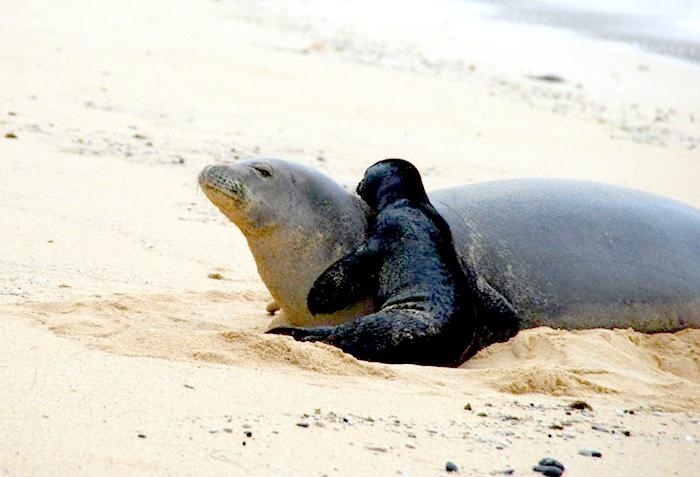 They’re born with a black coat which is molted 5-6 weeks after birth and replaced by the adult coat of light gray-brown. 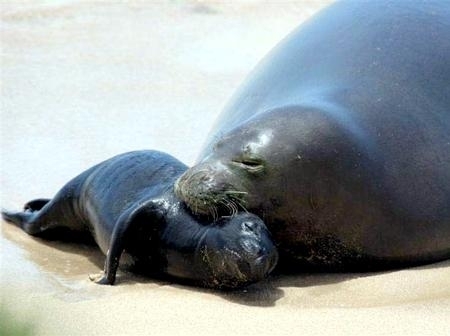 Mothers nurse their pups for 6-7 weeks after birth, during which time they do not feed usually losing an average of 90 kilograms. 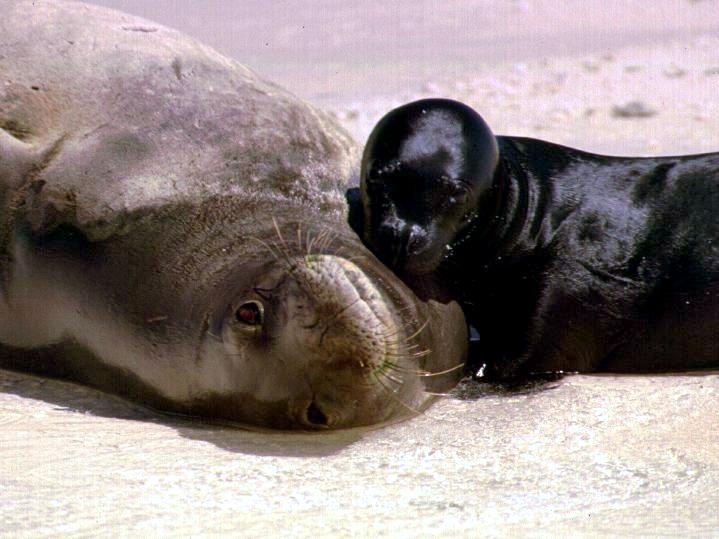 Females have been known to adopt pups and sometimes nurse pups exchanged between mothers. 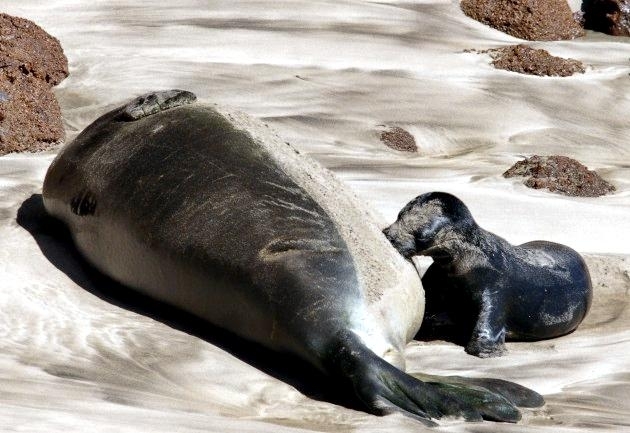 After weaning, the mother leaves to feed and the pup lives off its reserves until it is ready to leave the breeding site and learn to hunt. 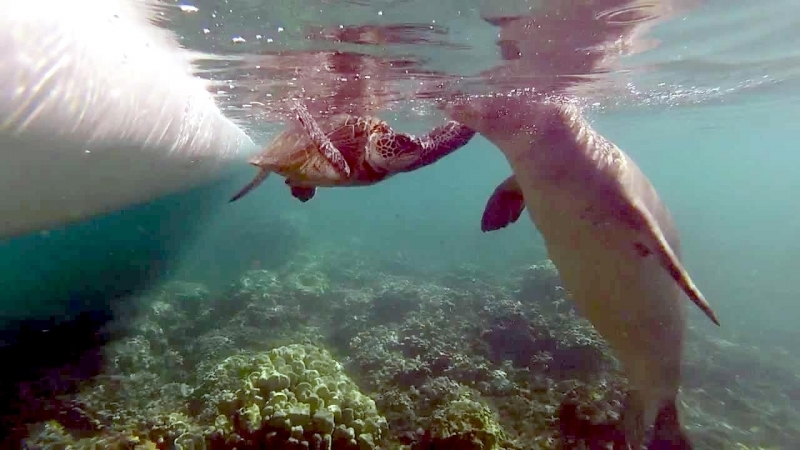 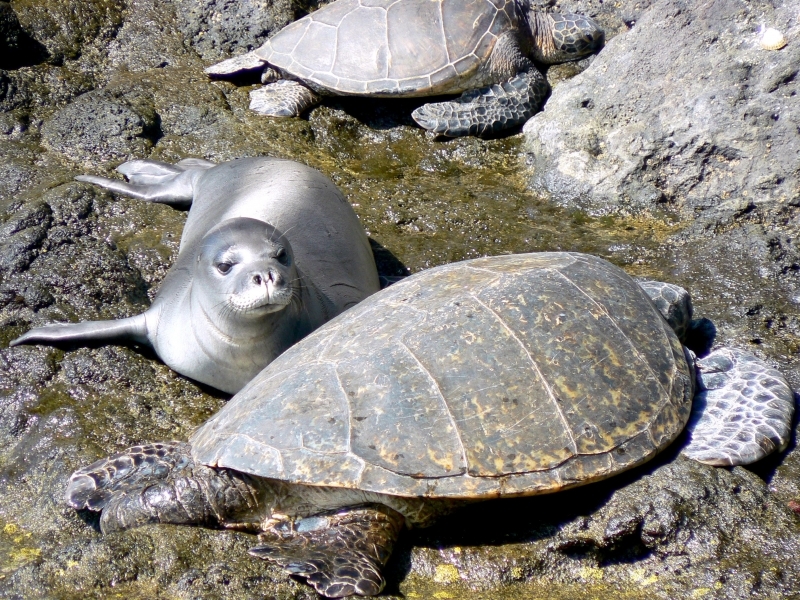 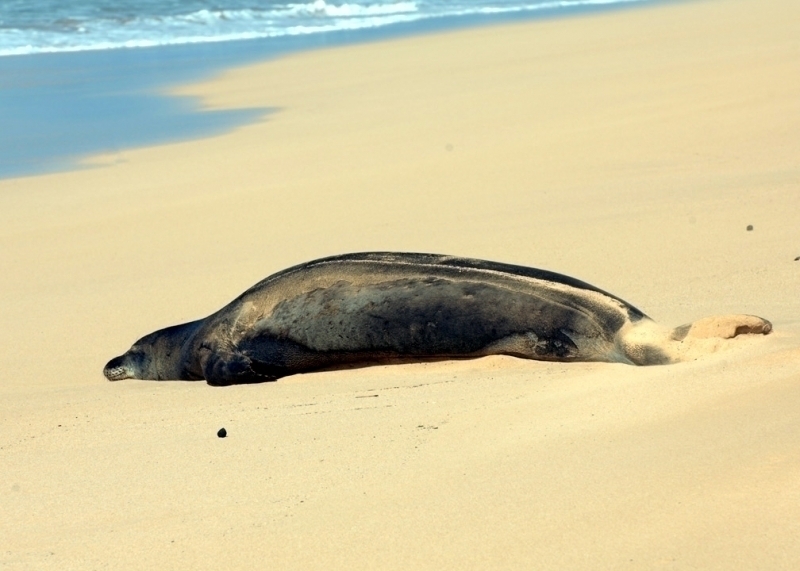 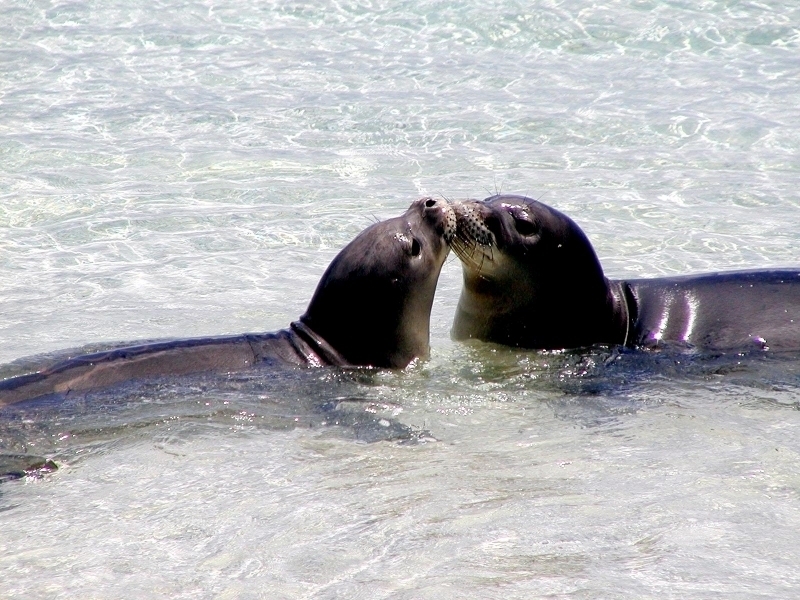 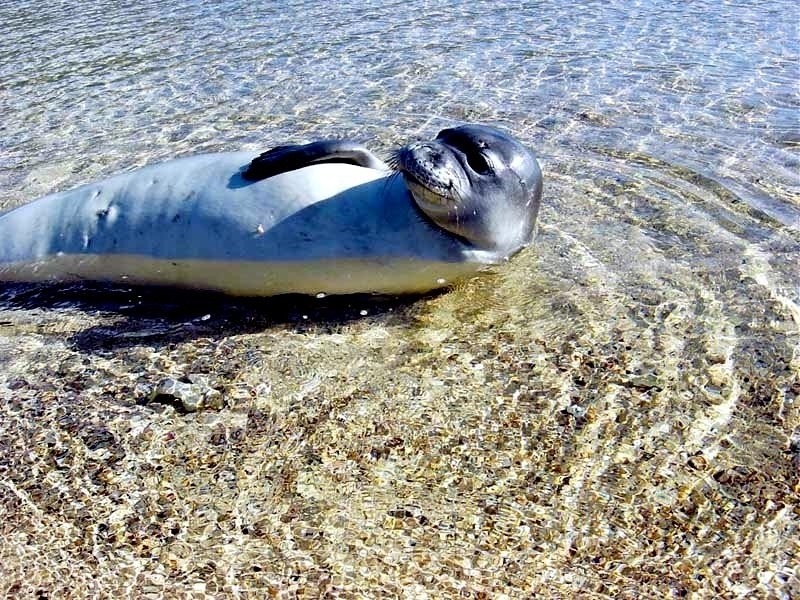 The mating ritual of Hawaiian Monk Seal is rarely witnessed because it takes place at sea. 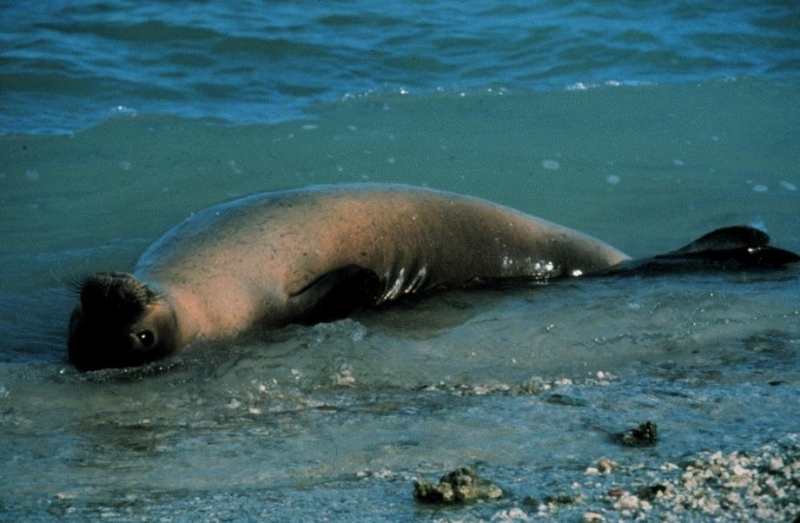 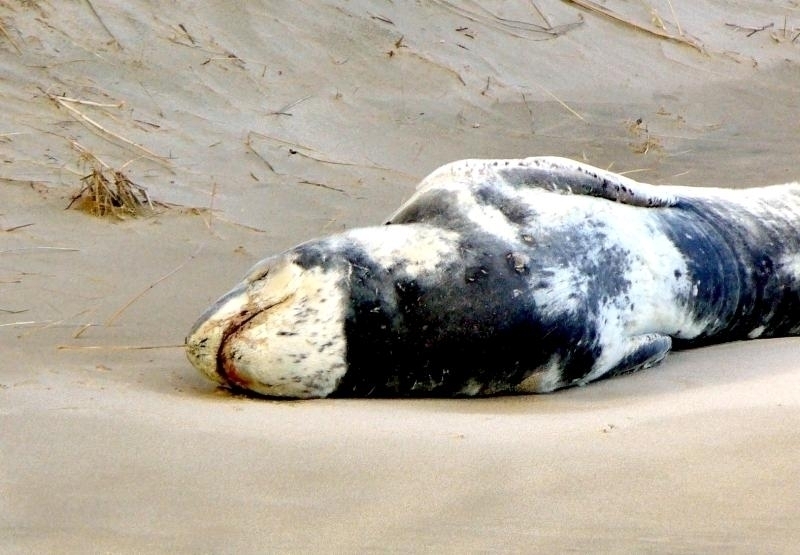 Adult males have been seen “mobbing”, an aggressive behavior where one or more males attempt to mate with immature seals of both sexes, often injuring or killing them. 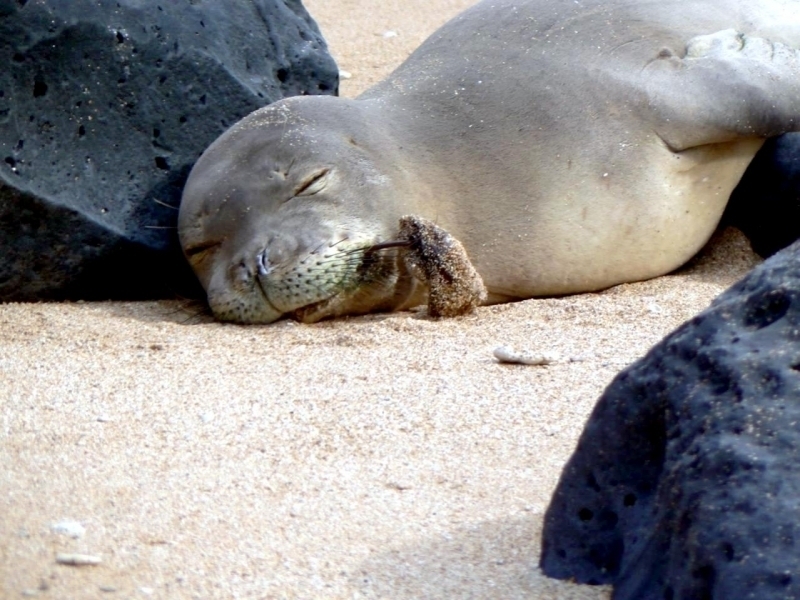 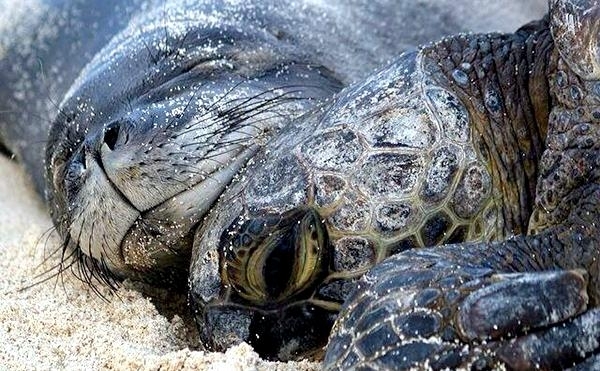 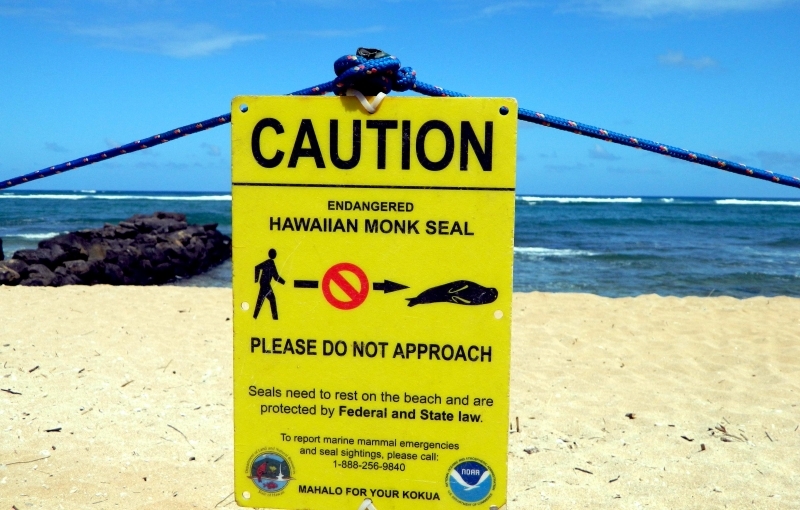 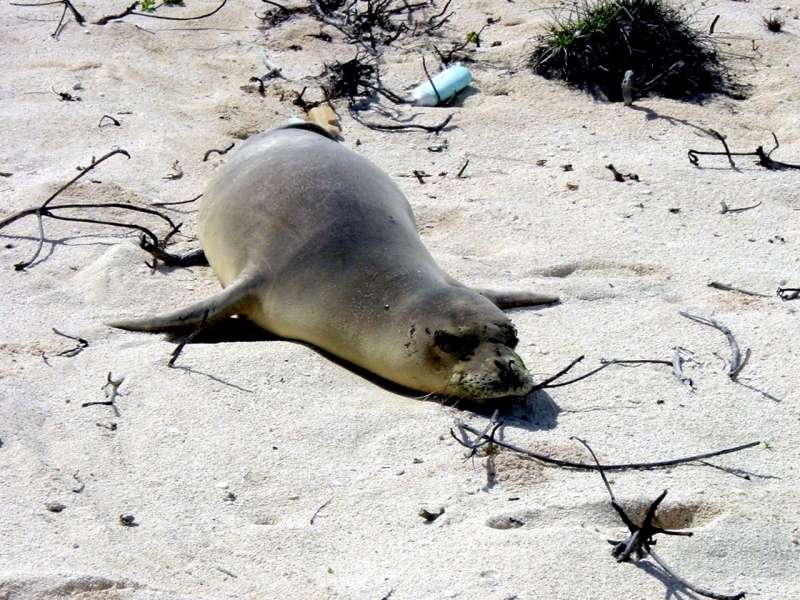 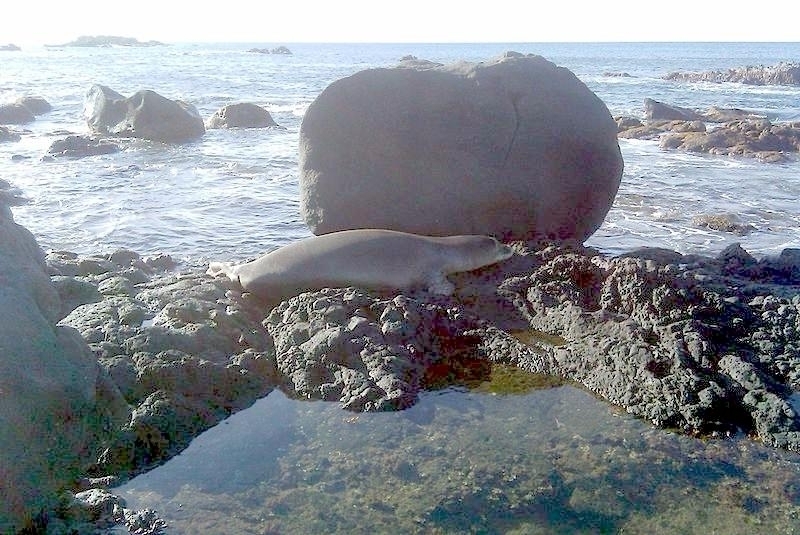 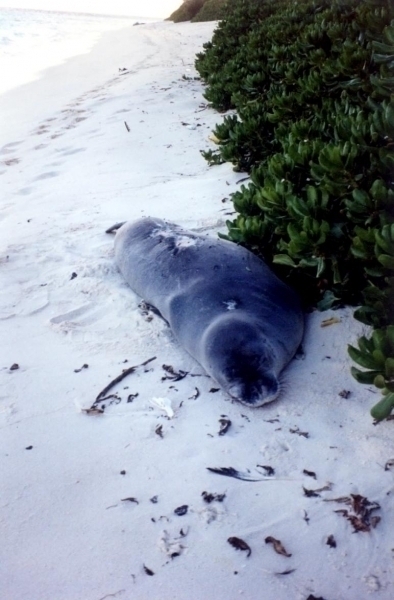 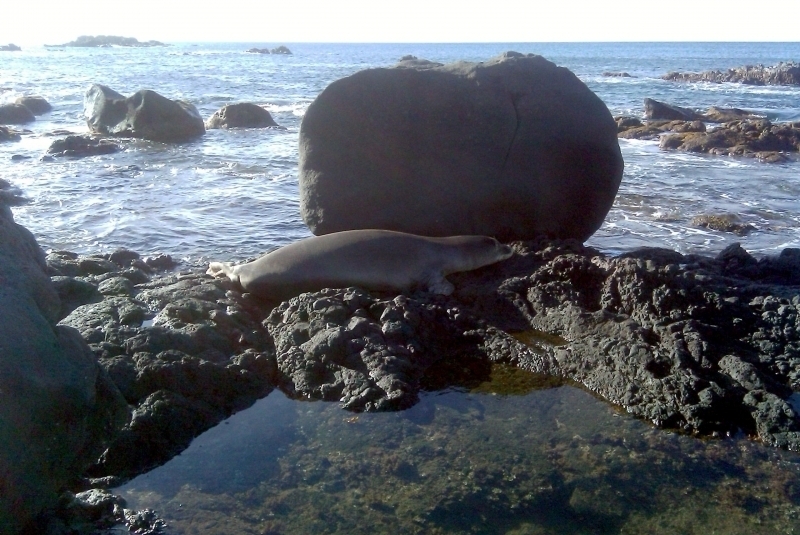 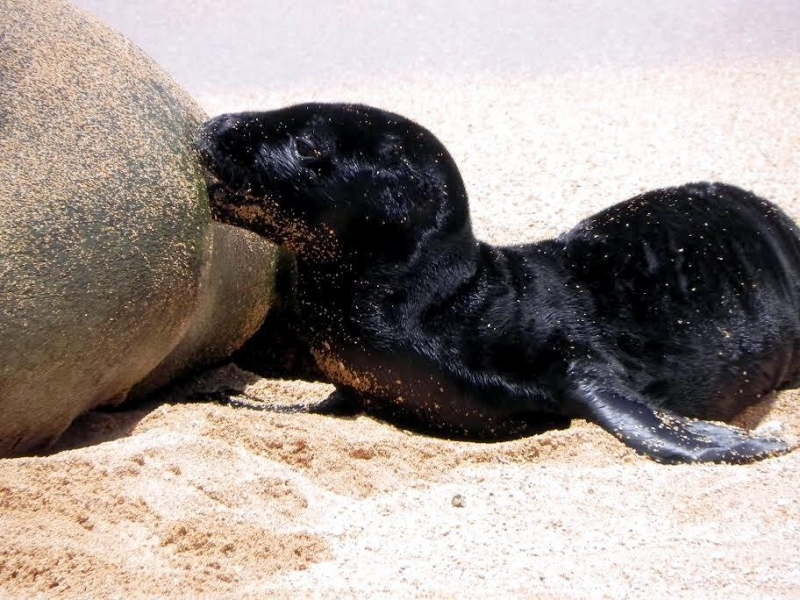 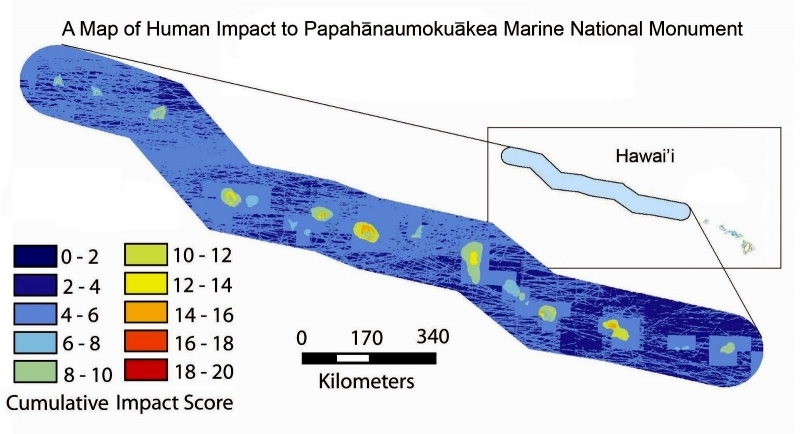 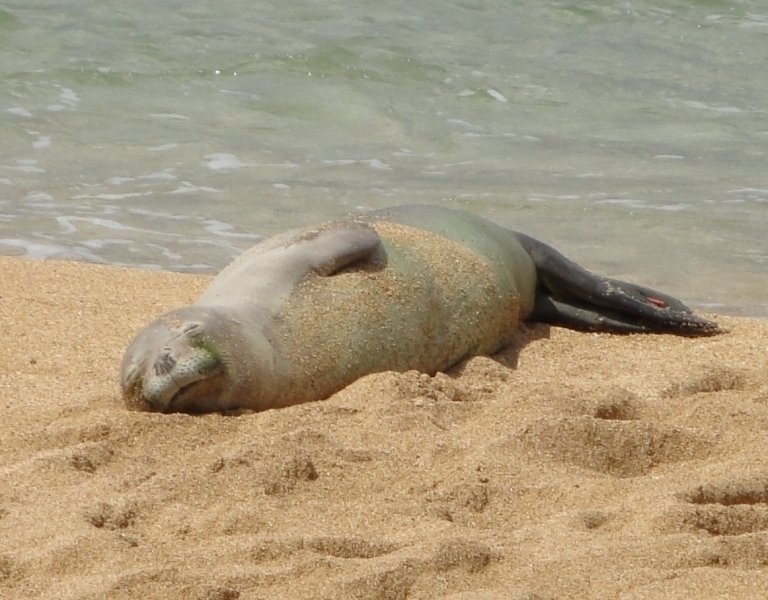 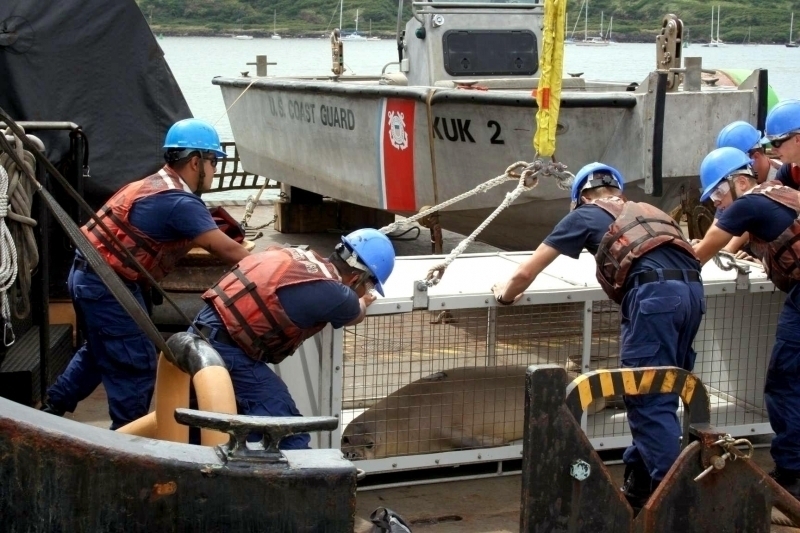 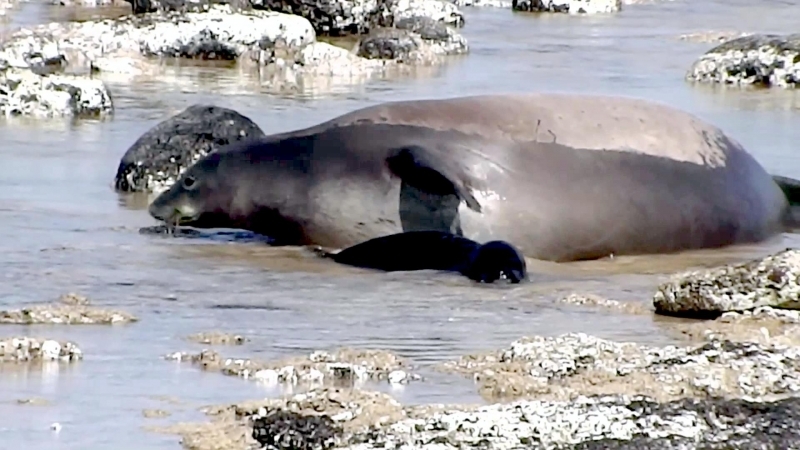 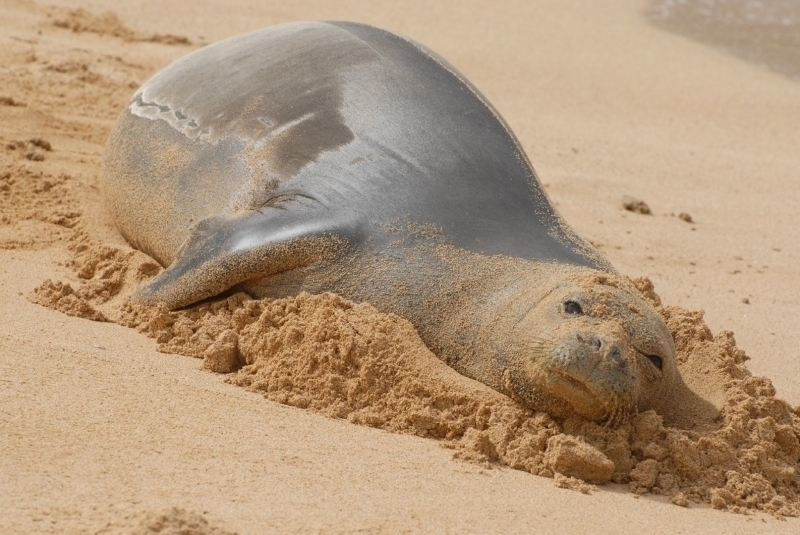 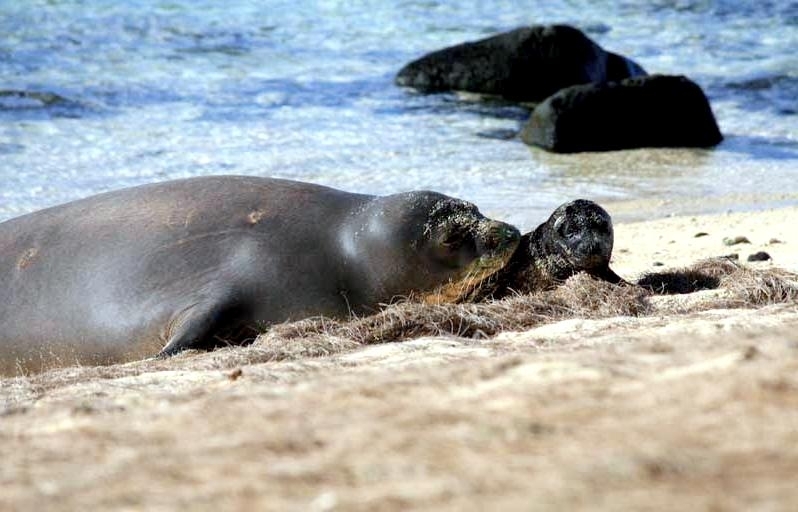 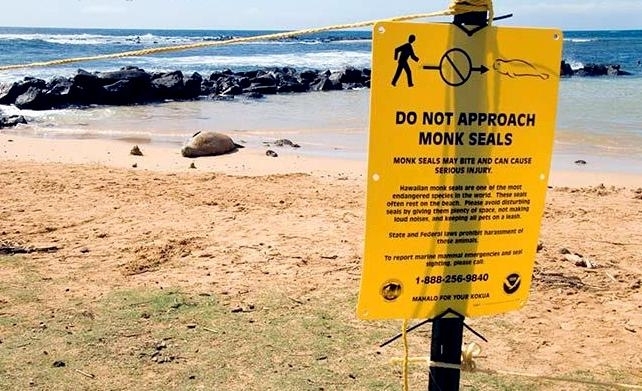 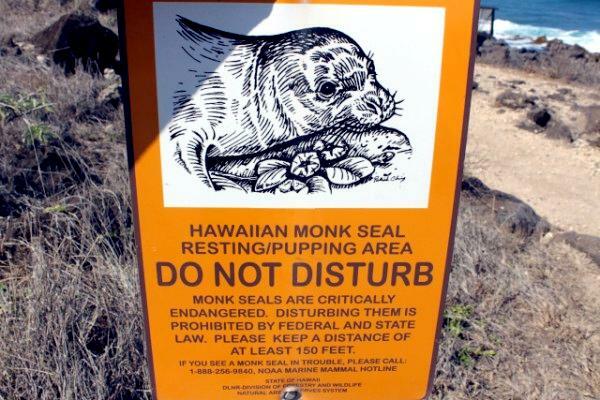 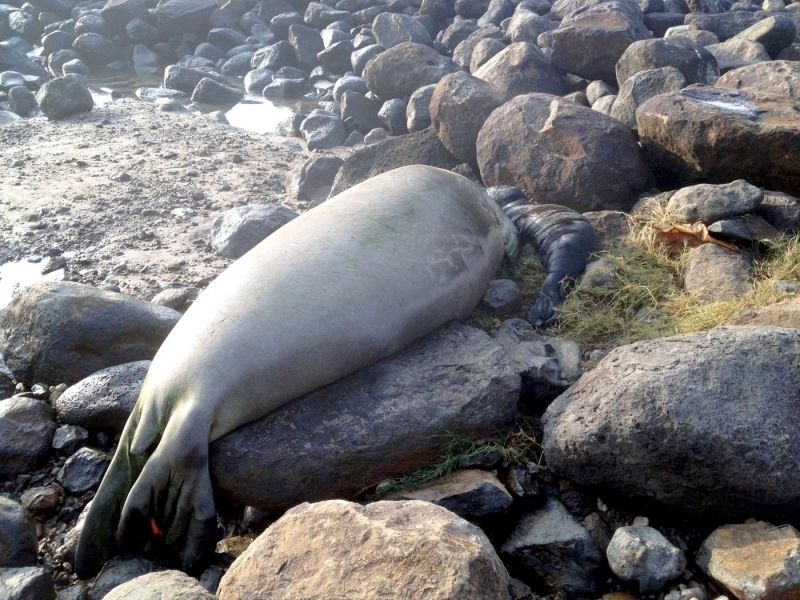 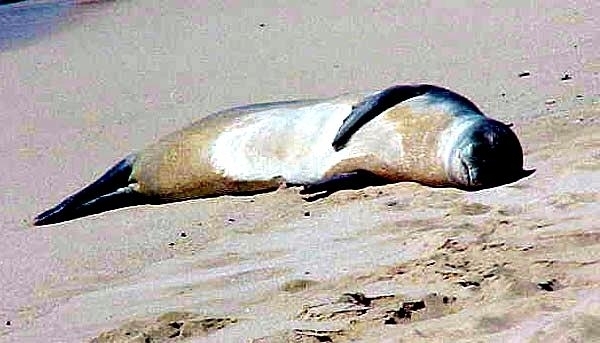 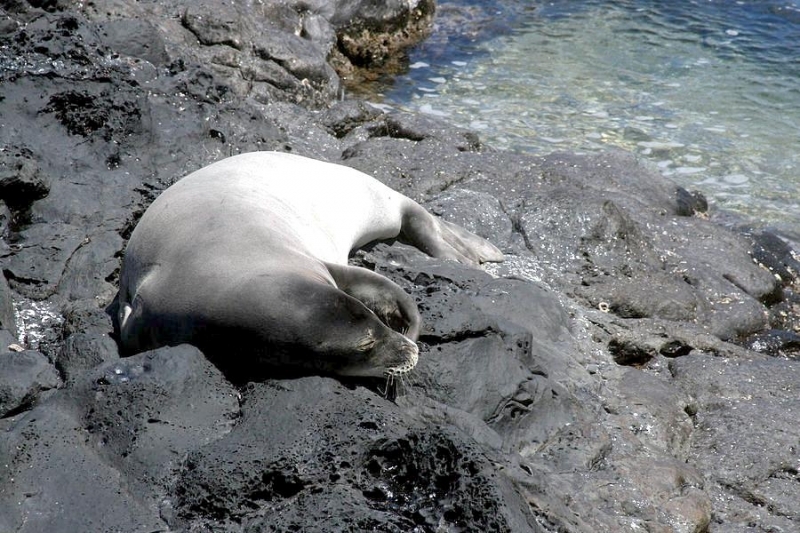 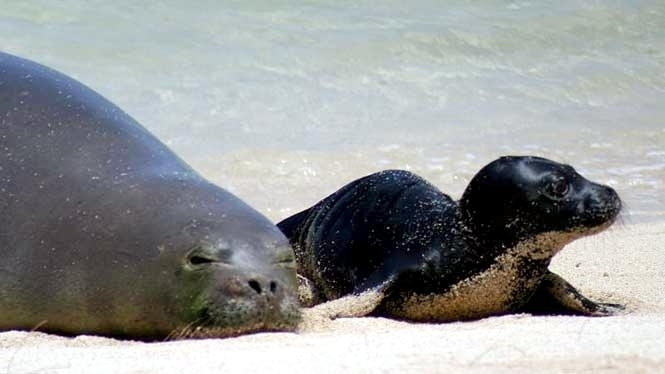 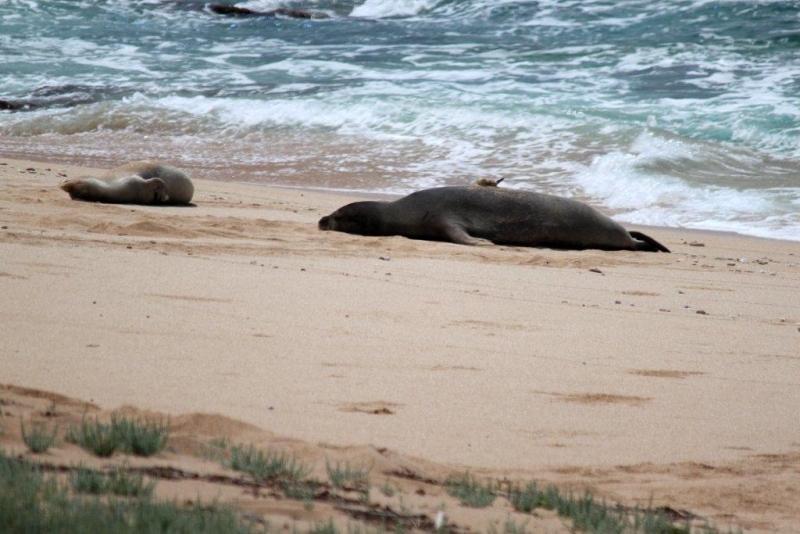 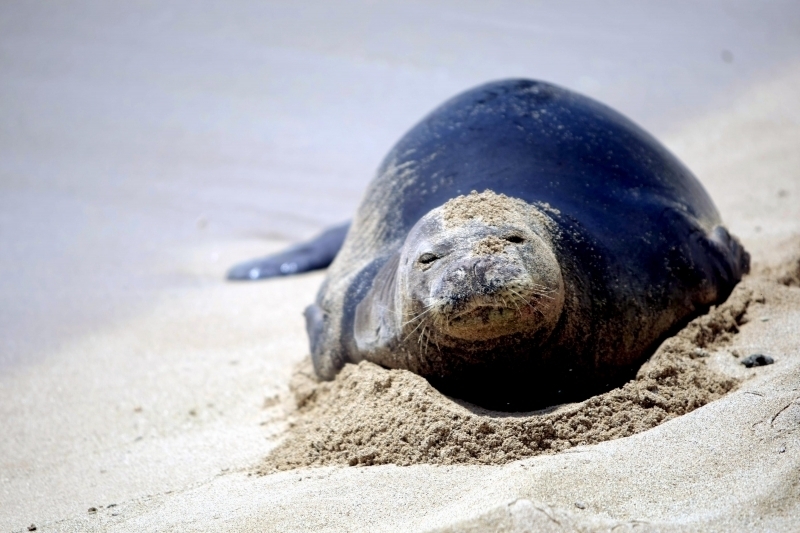 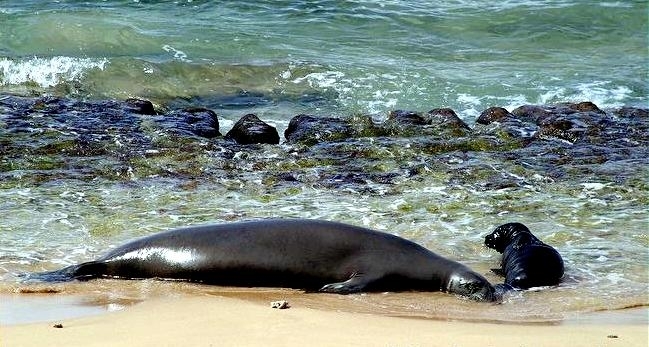 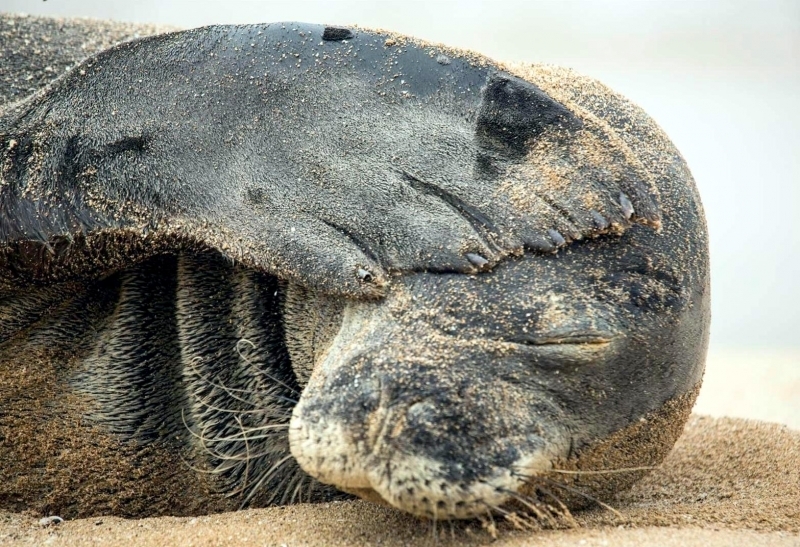 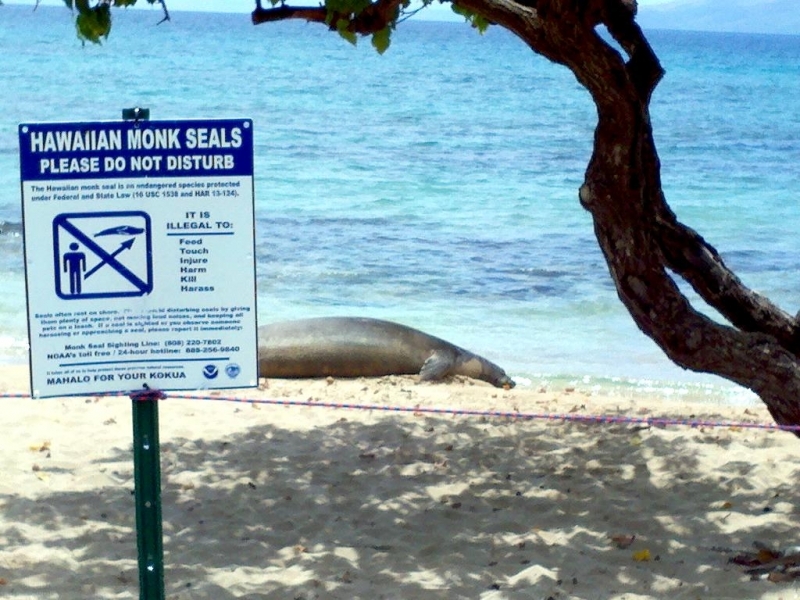 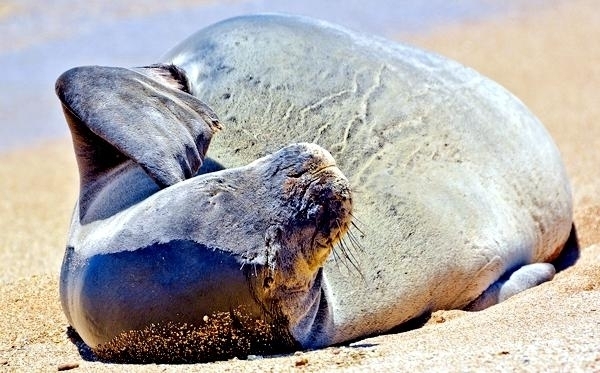 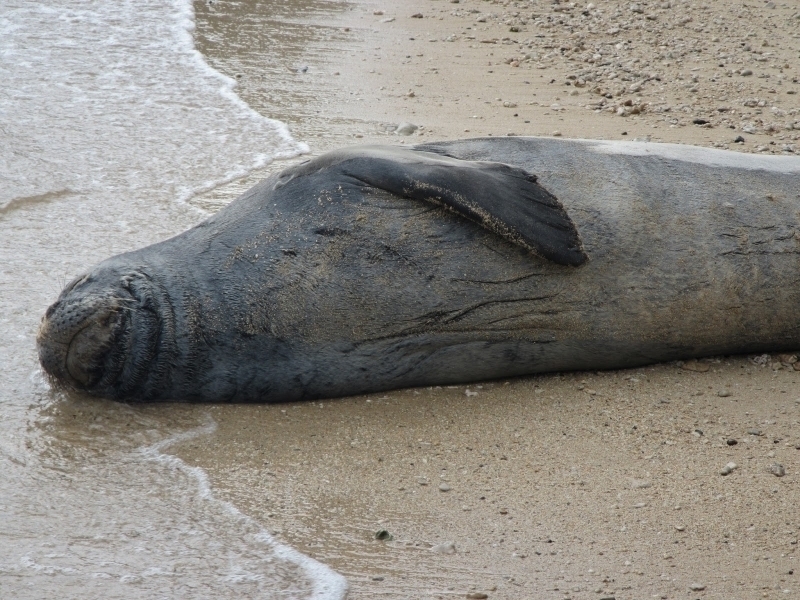 This behavior is likely due to the disparity between the number of males to females in Hawaiian Monk Seal populations as it seems to occur where there are more males than females.